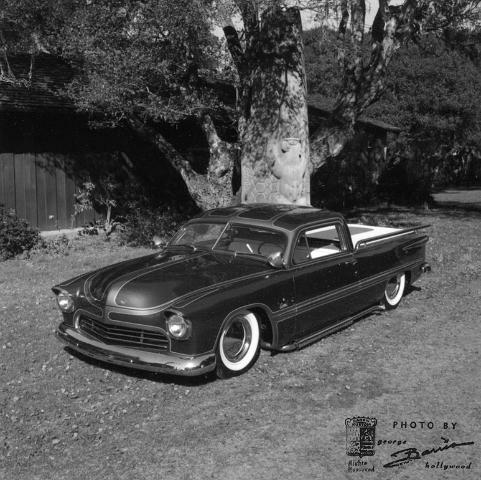 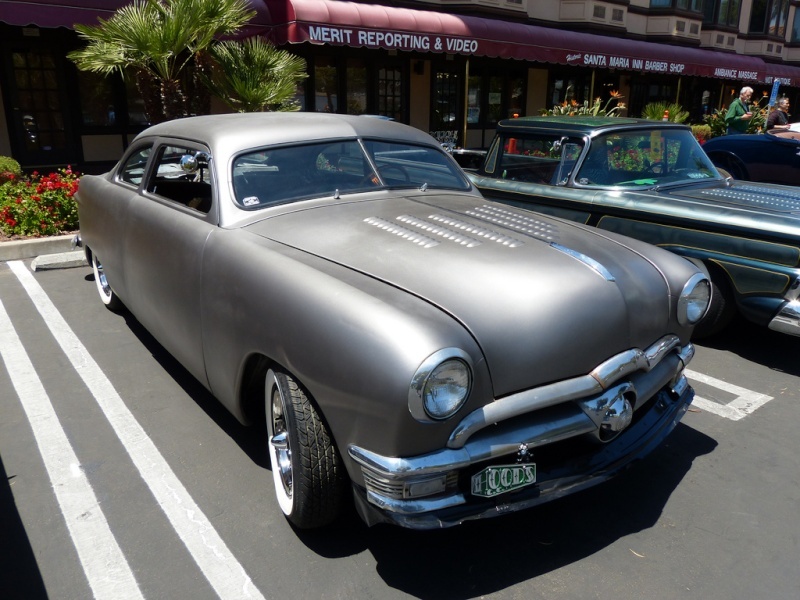 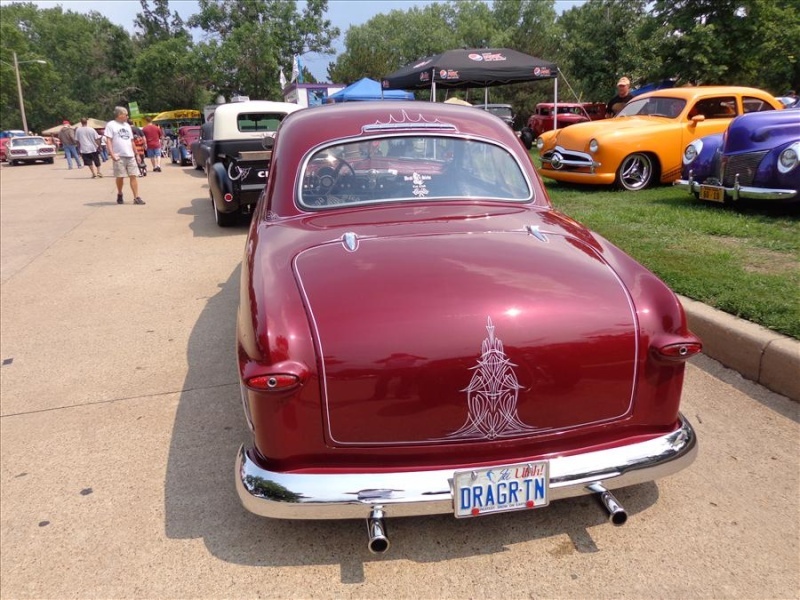 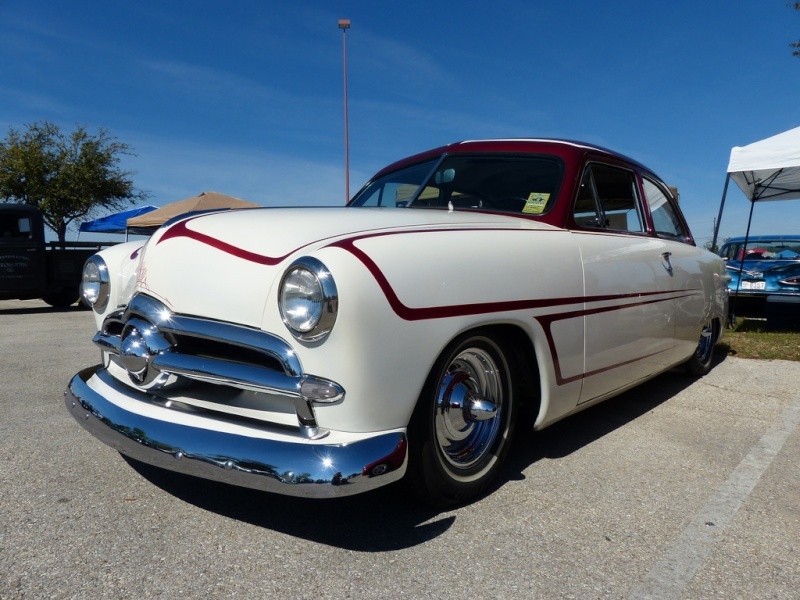 1950 Ford tudor built and owned by Richard Gregg of Sacramento, California. 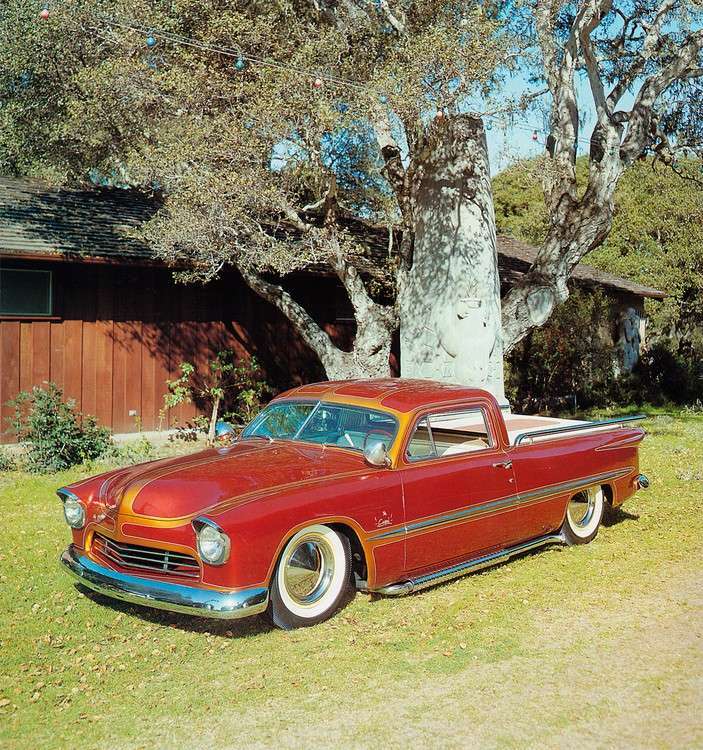 Rick's tudor was transformed to a pickup. 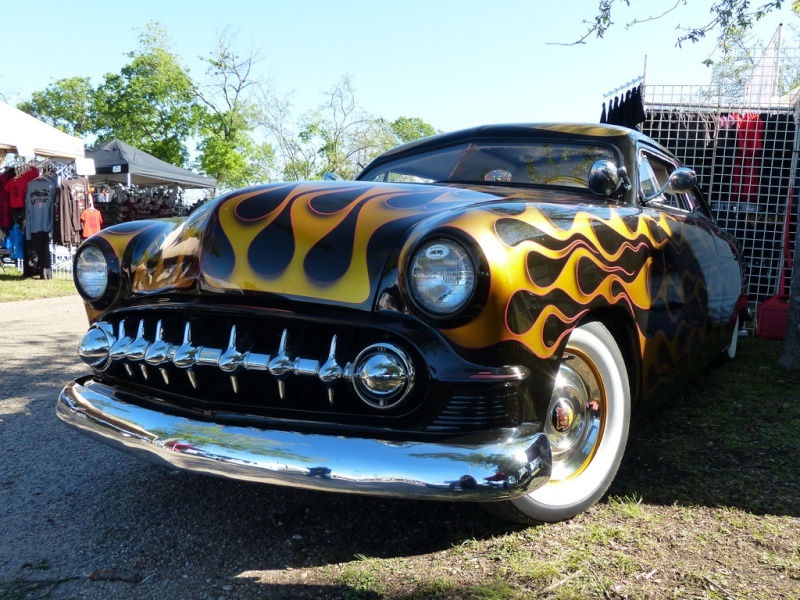 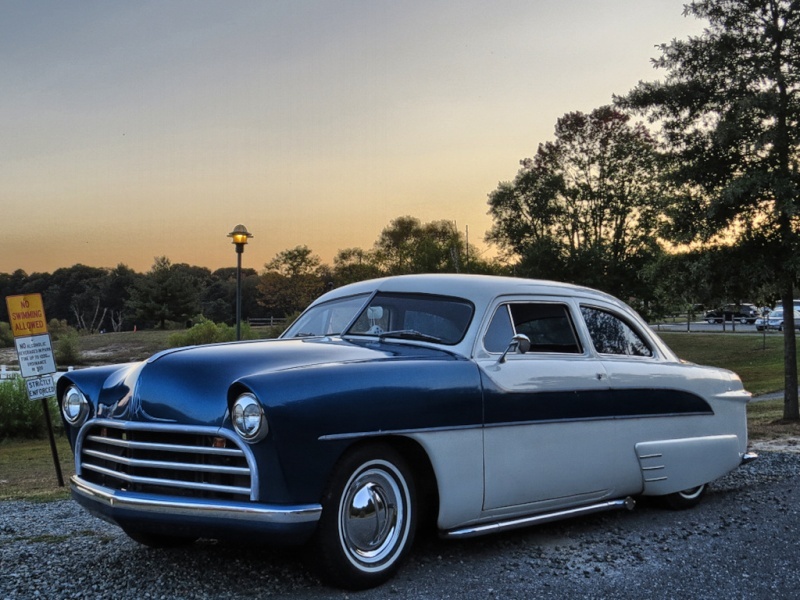 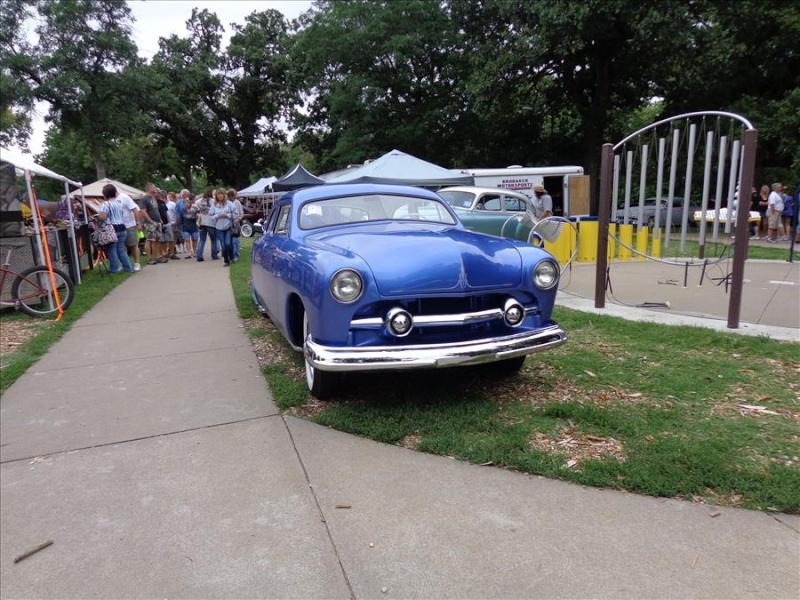 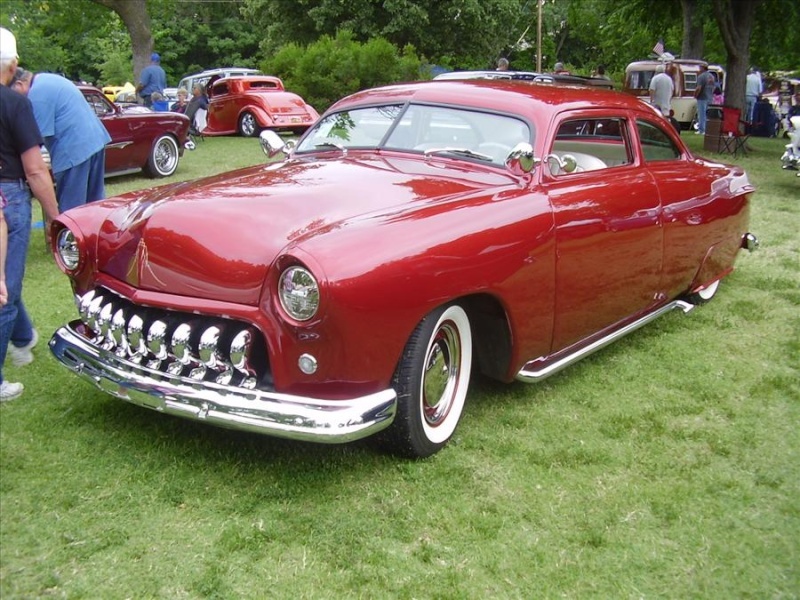 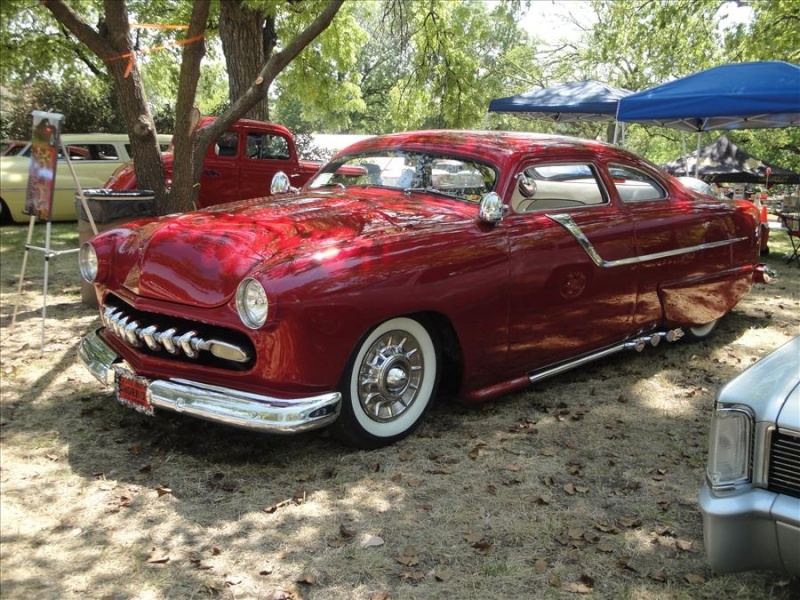 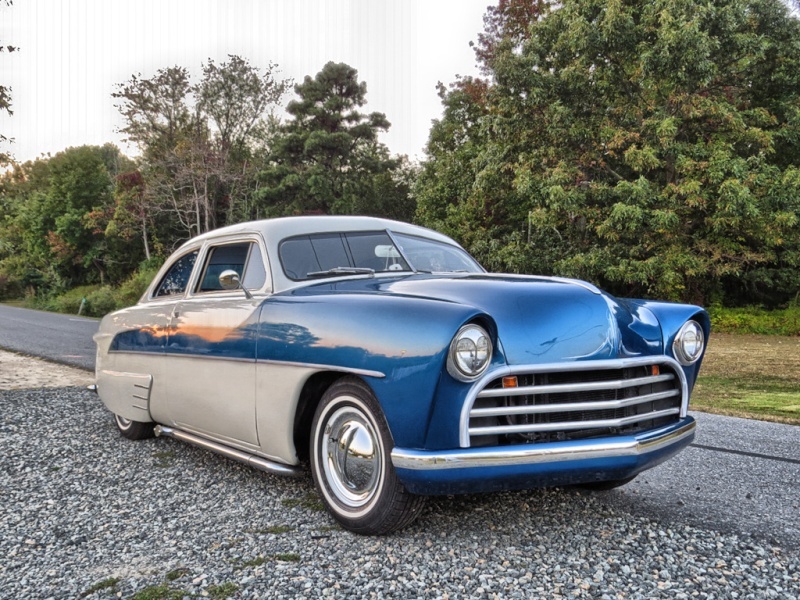 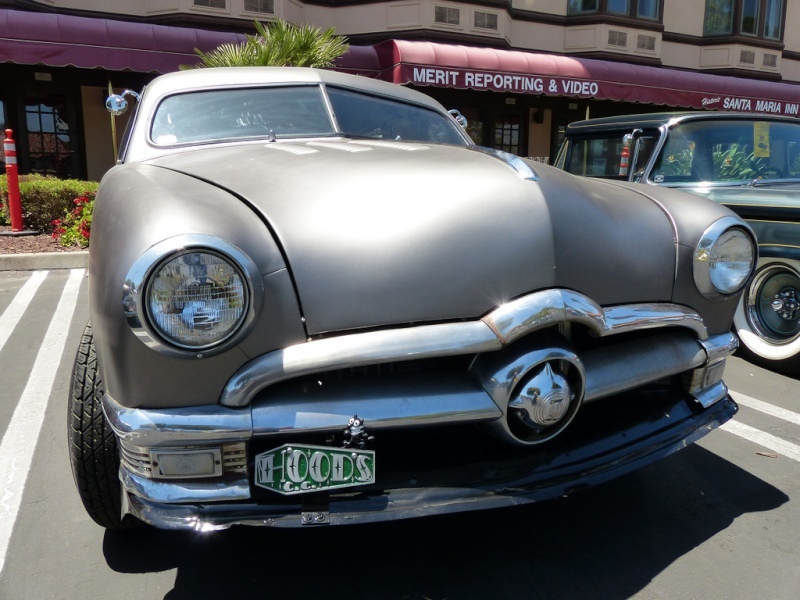 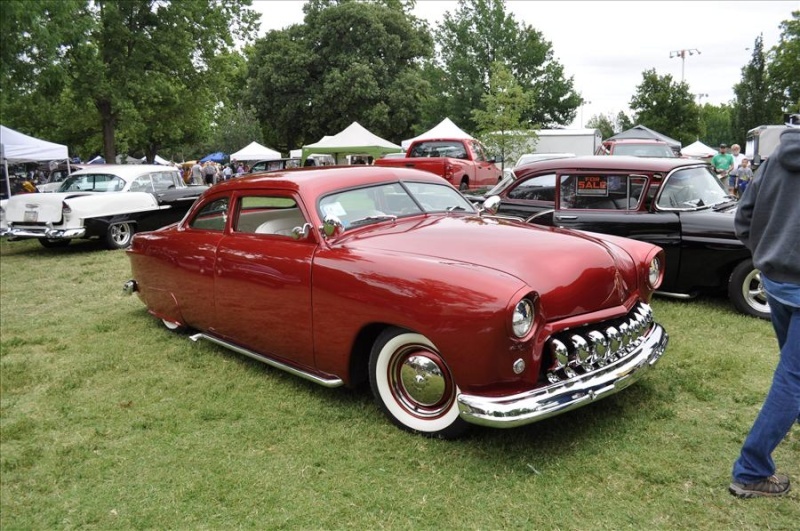 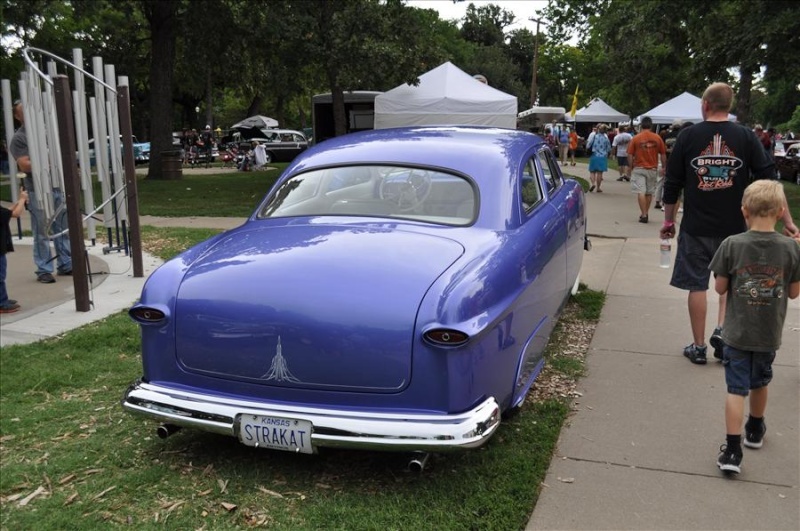 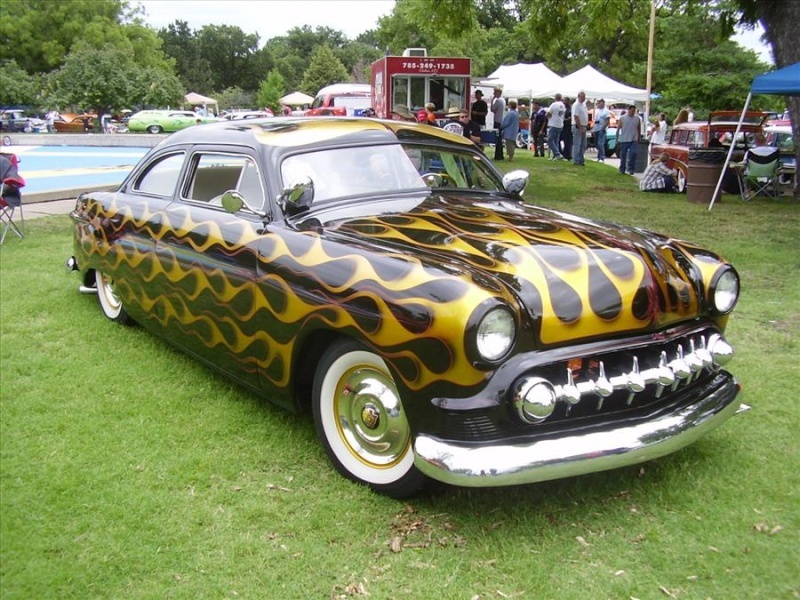 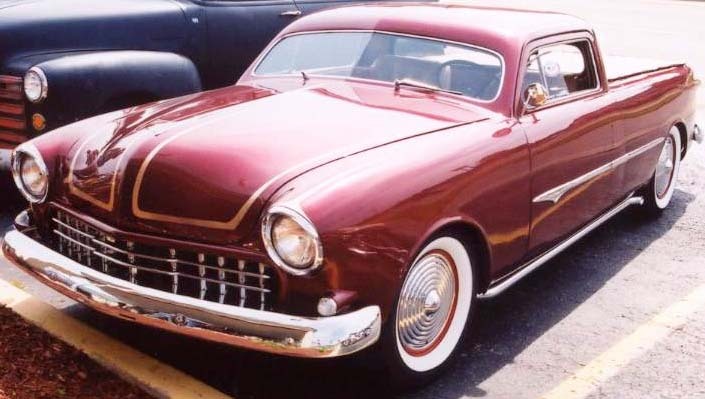 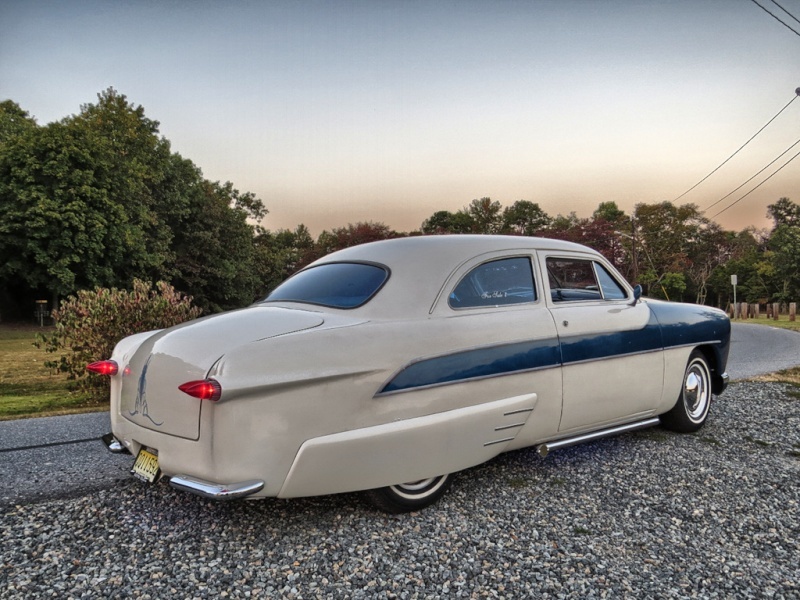 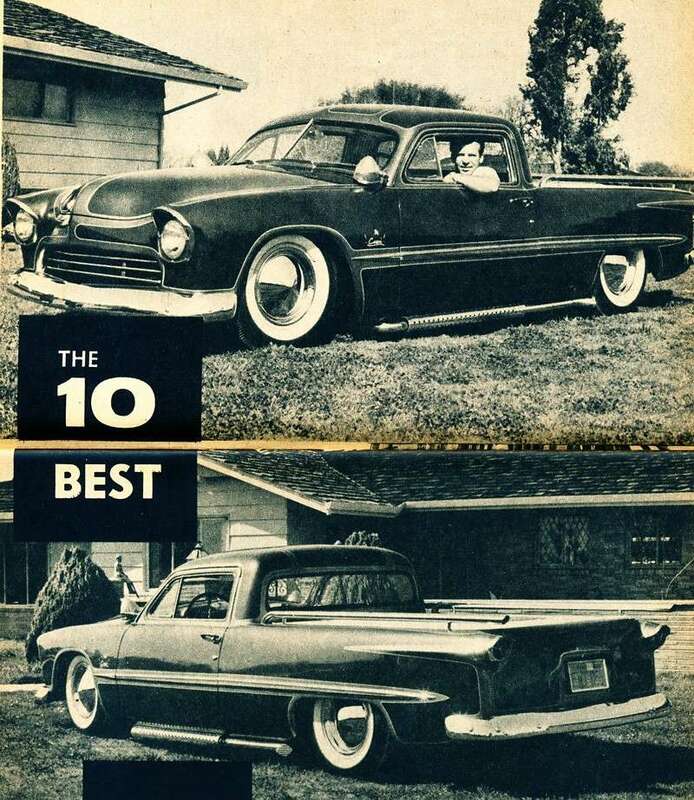 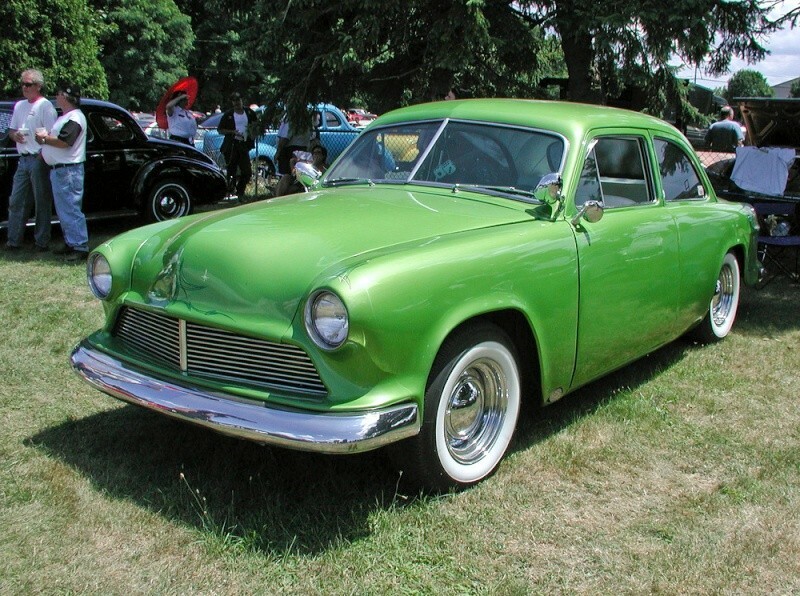 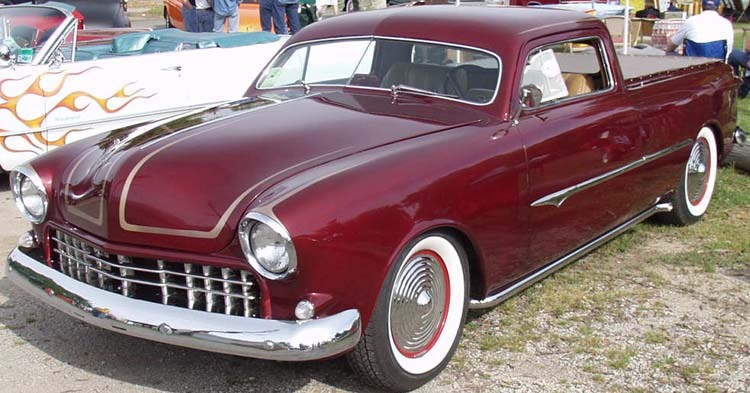 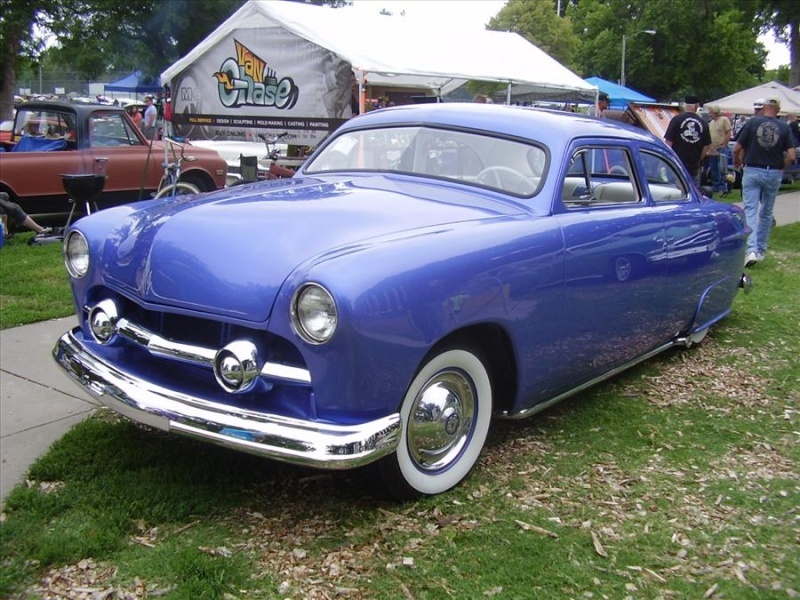 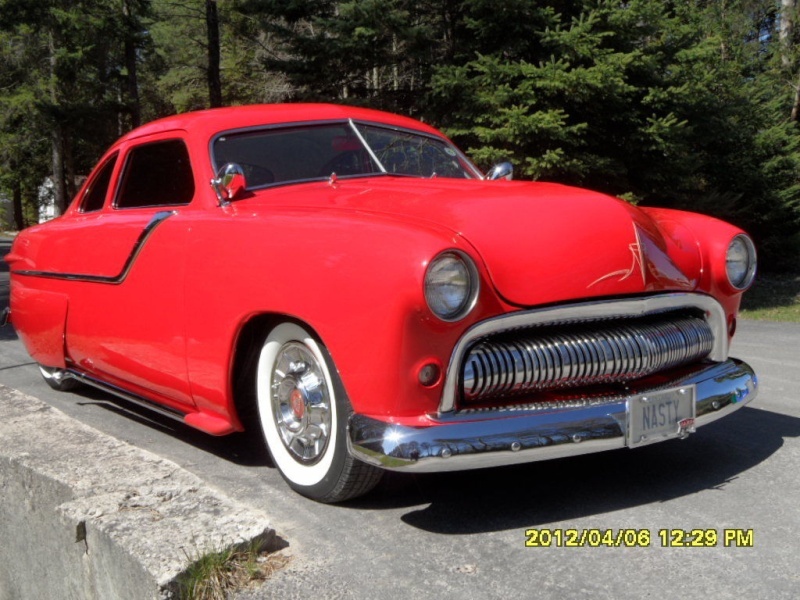 The body was sectioned 5 inches and the top was chopped 5 inches.A 1950 Mercury grille shell was molded to the body, and a tubular floating grille was fit into the opening. 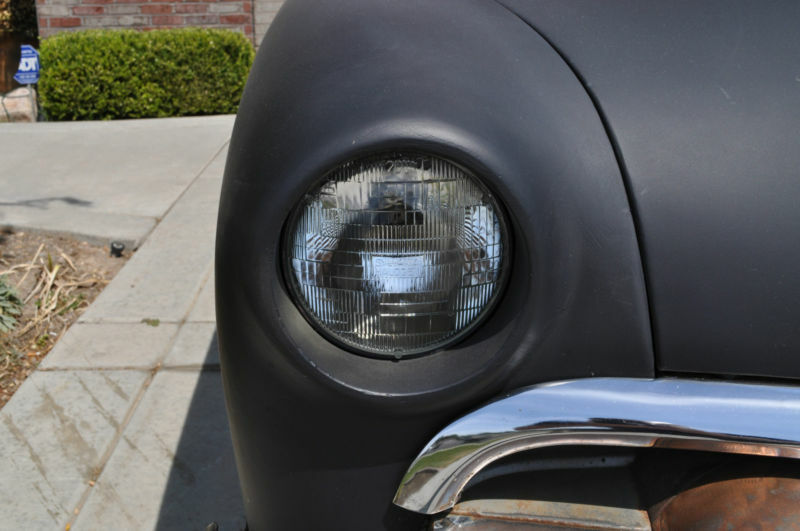 The front fenders were reworked to accept the frenched 1957 Chevrolet headlight rims. 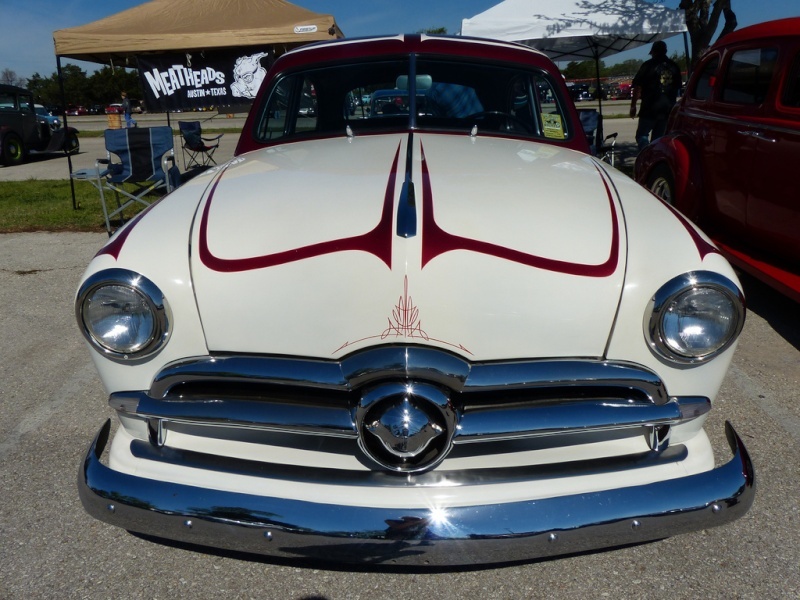 The hood was shaved, peaked and reshaped into an pancake opening. 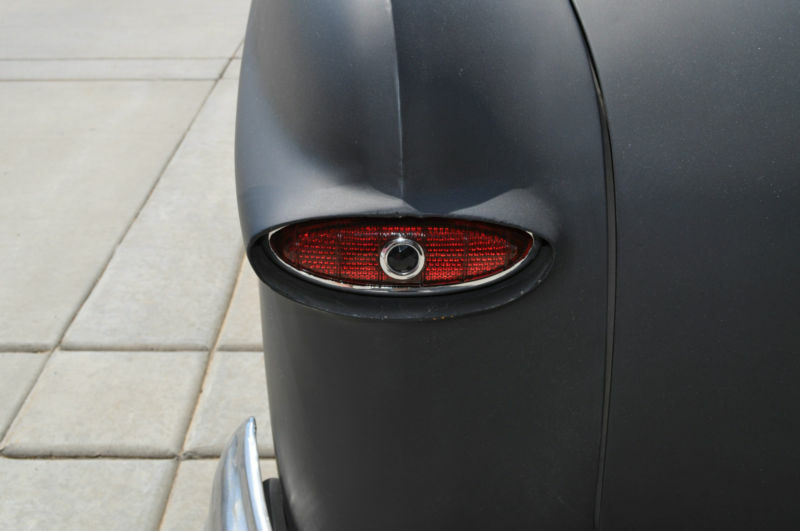 1954 Pontiac taillights were adapted to the rear fenders. 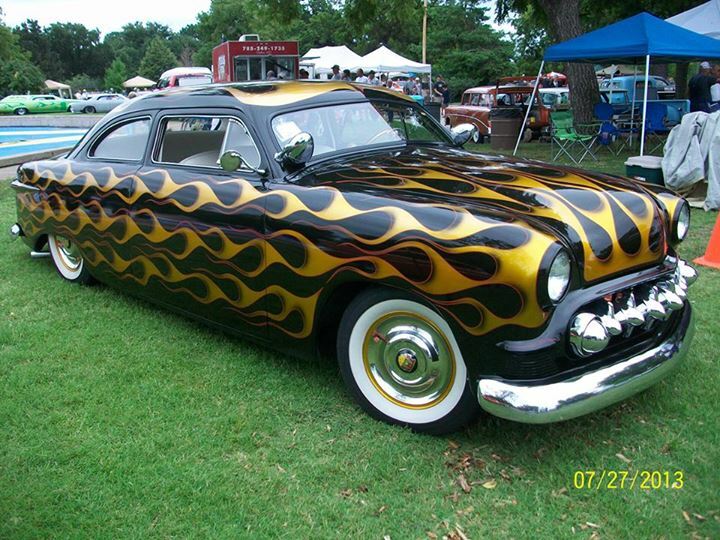 The body was painted copper with gold scallops. 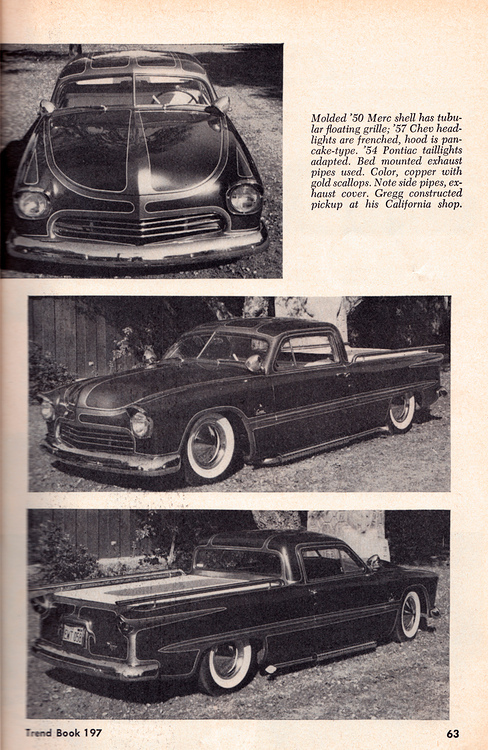 The car had an unique exhaust pipe installation, they were actually routed up behind the doors and mounted on each side of the pickup bed, running along the fender line. 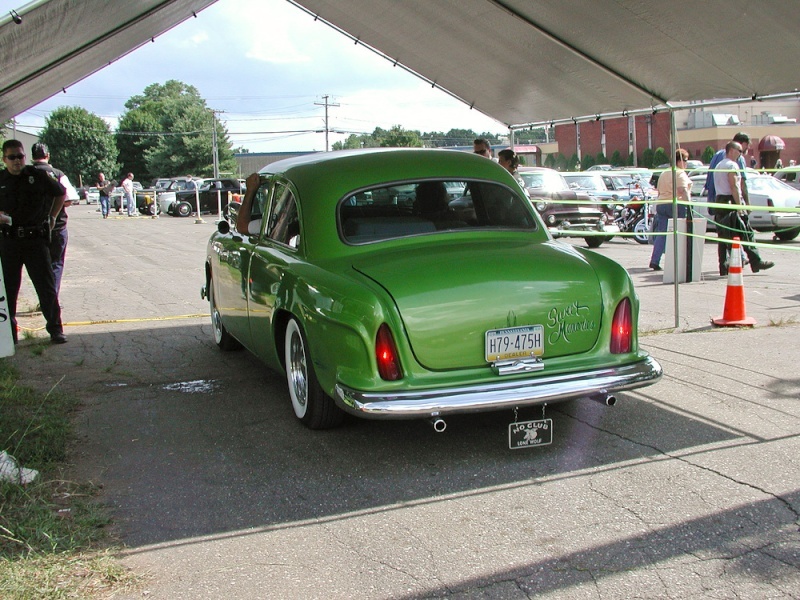 Dual spotlights and side pipes were mounted to give the car a lower appearance. 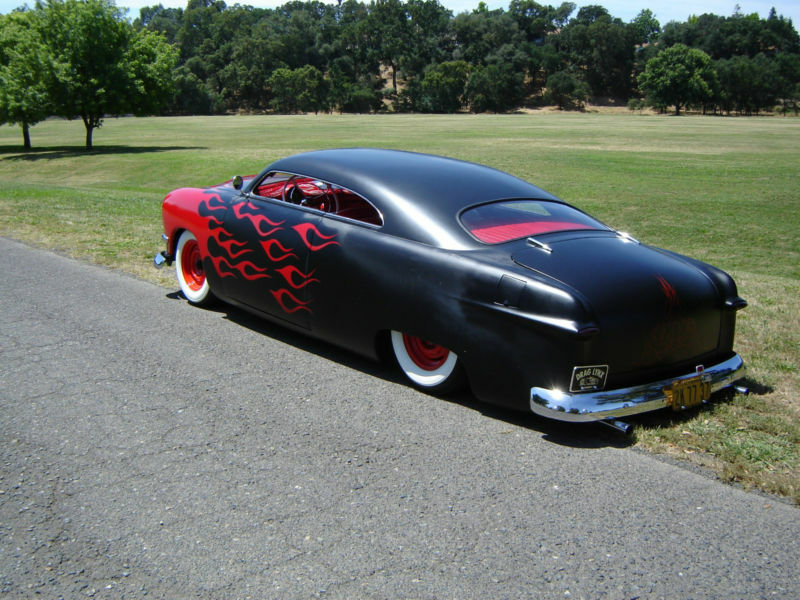 1951 Ford chop top, Cool car chopped 6 in front and 8 in rear, back window layed down, needs side windows. 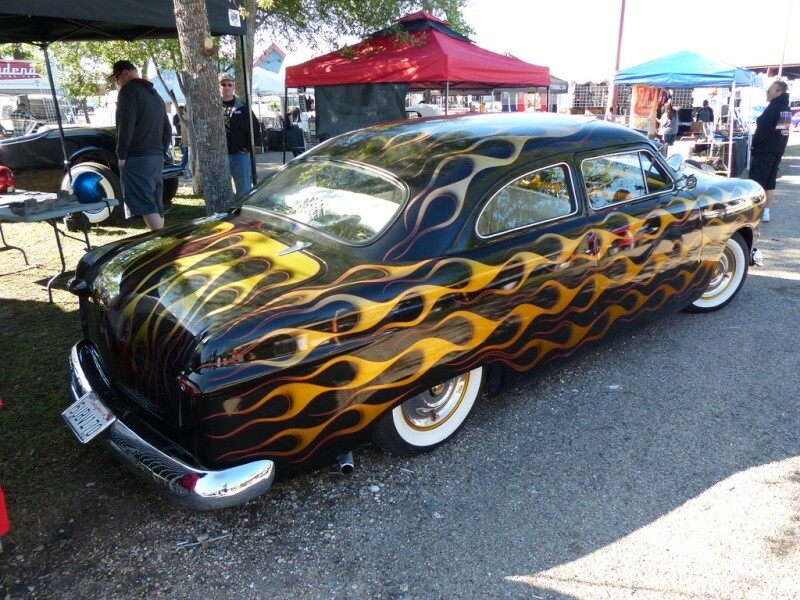 Has regulators just not windows. 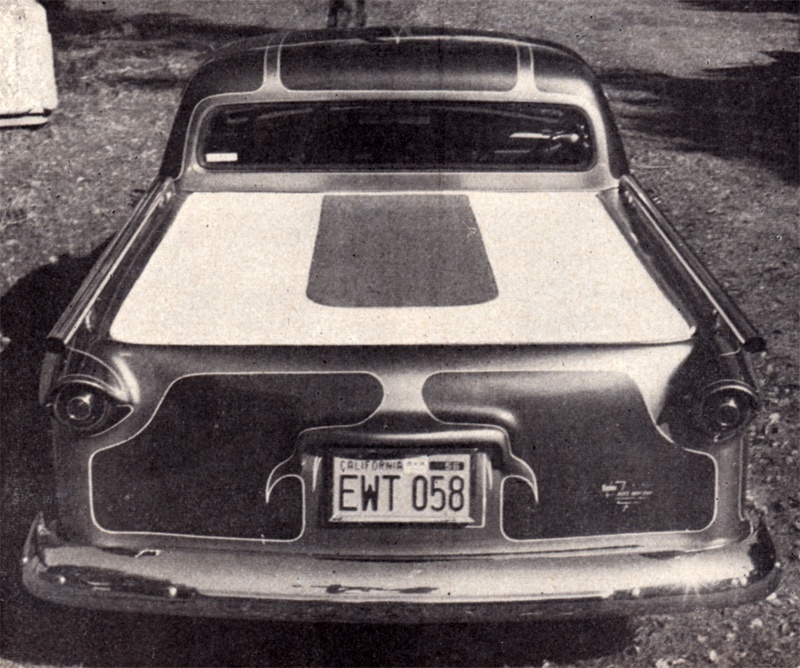 Removed wing windows. 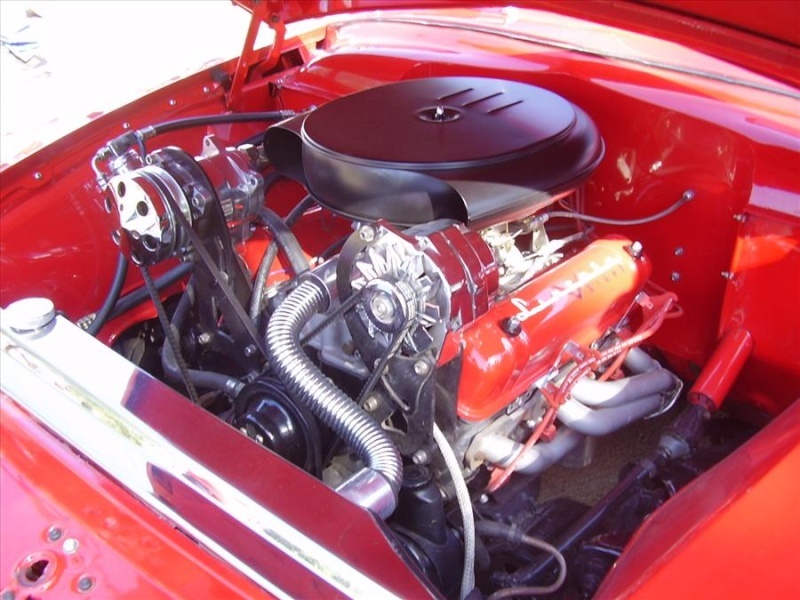 Has small block chevy with auto trans (small leak). 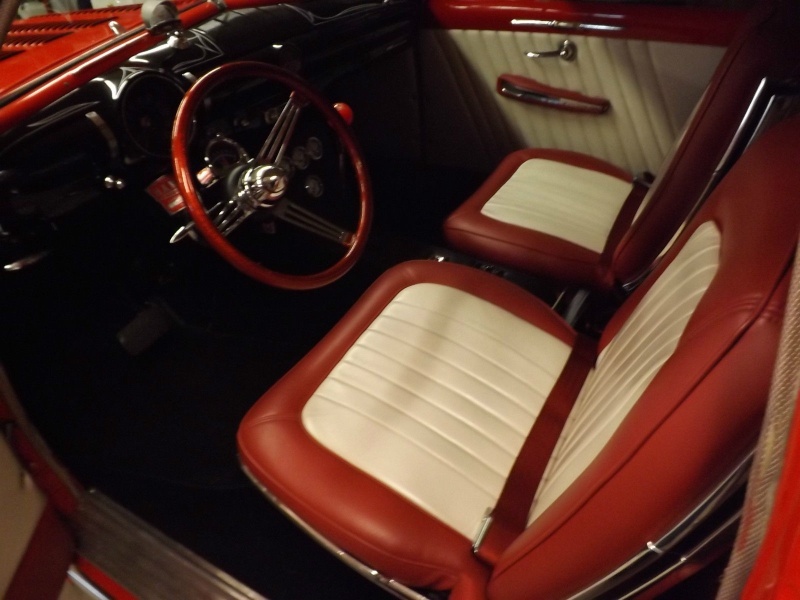 New interior and carpet. 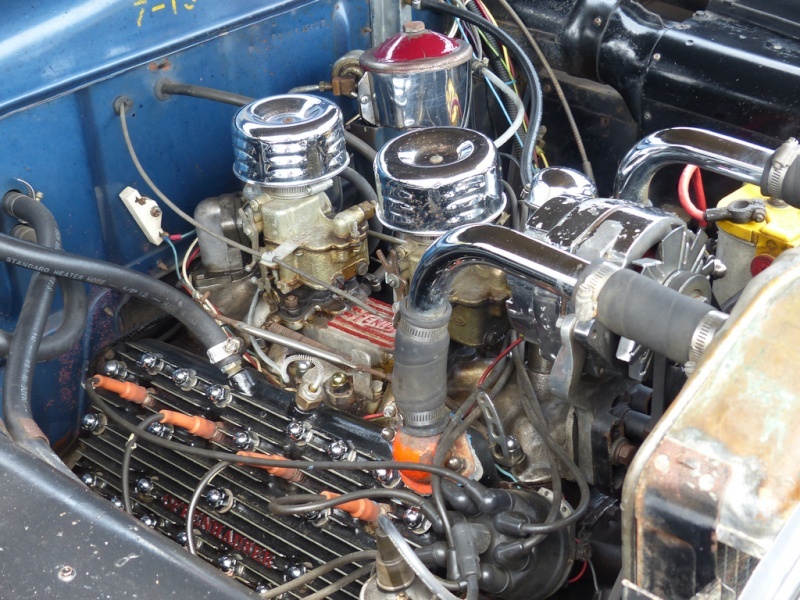 All new brake system and fuel system, Completely rewired. 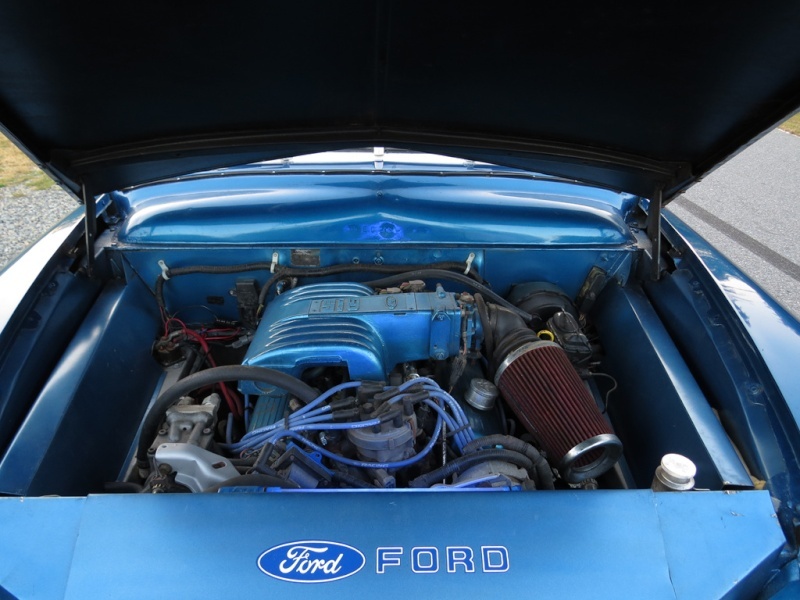 Rebuilt stock suspension with newer front springs 2 inches shorter and 4 in blocks on rear. 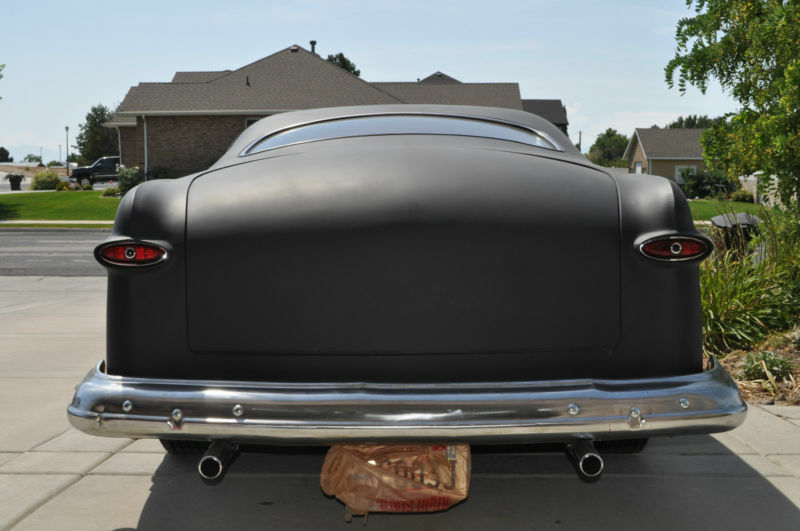 New dual exhaust with functioning Lake Pipes on pull cables from the drivers seat.. 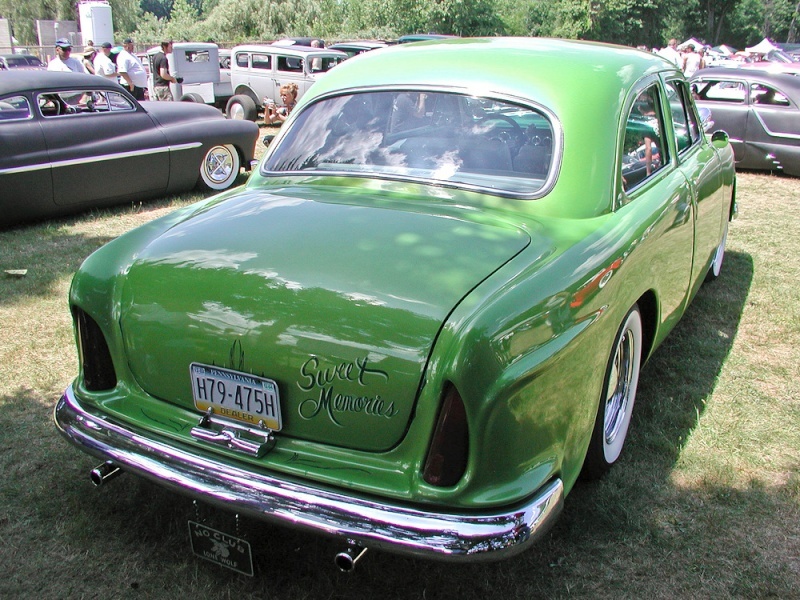 Dummy spot lights, shaved door handles and fuel door, Remote (electric) trunk release. 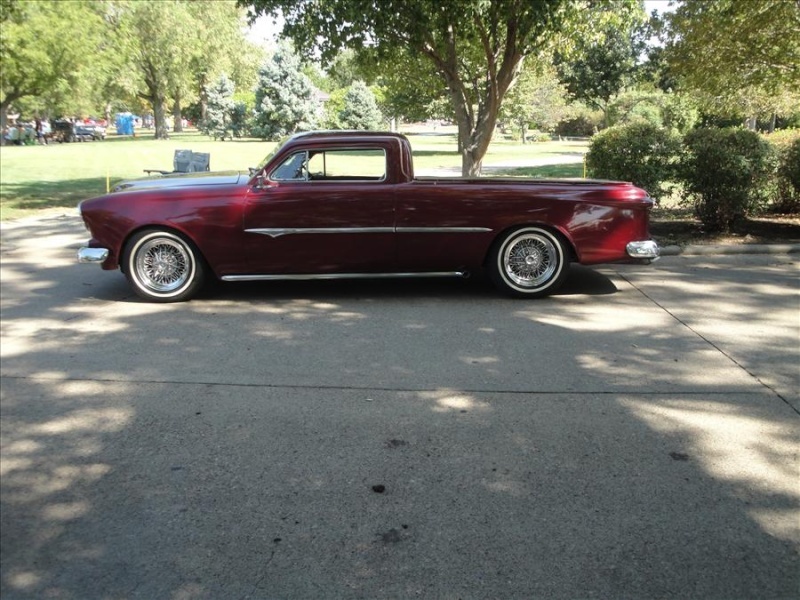 New tires with around 2000 miles. 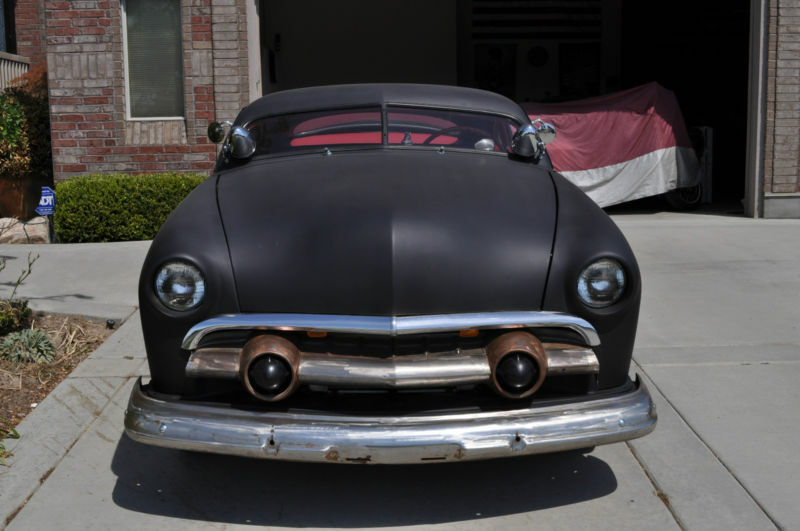 Runs and drives I have been driving it about 2 yrs since finished. 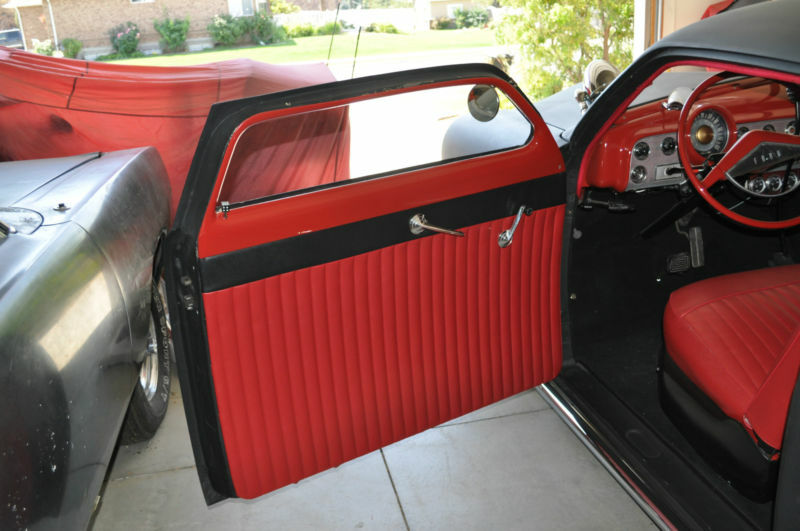 Have window molding just needs to be cut down. 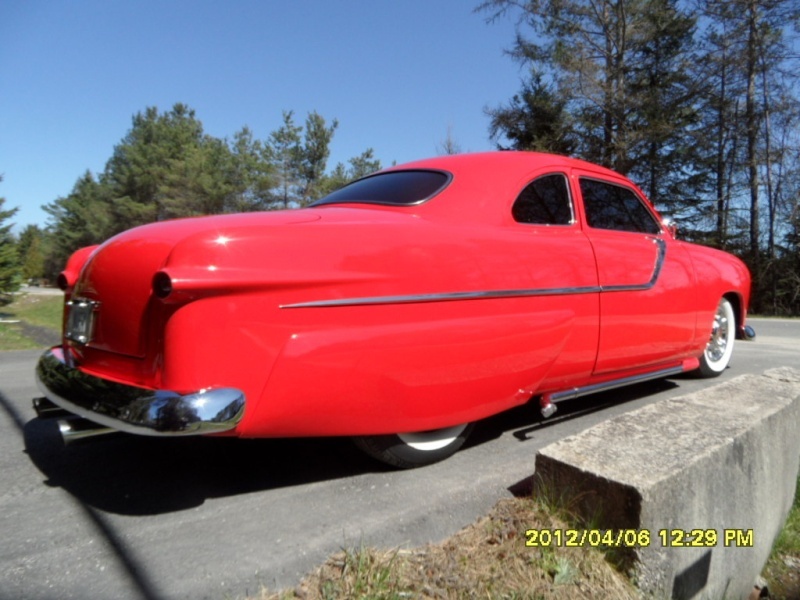 Replaced rust in floors, New rocker panels and bottoms of fenders. 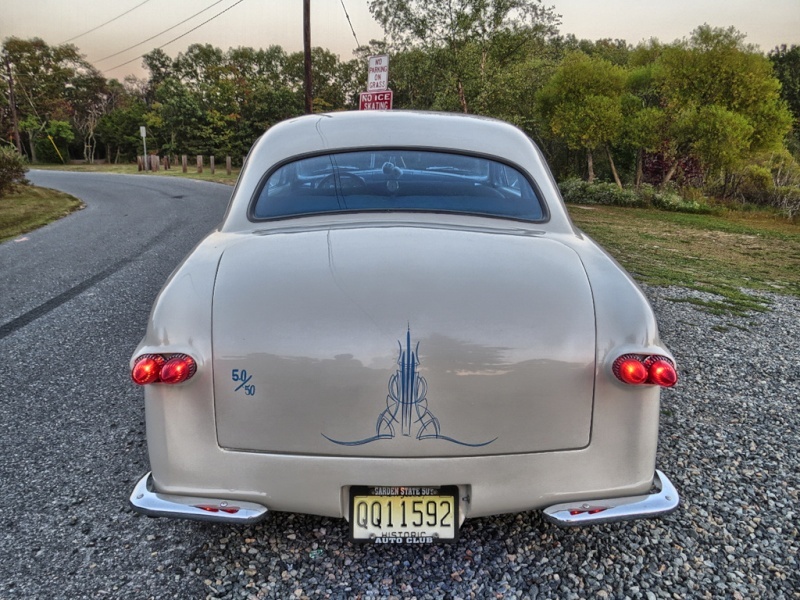 Frenched headlights and tail lights. 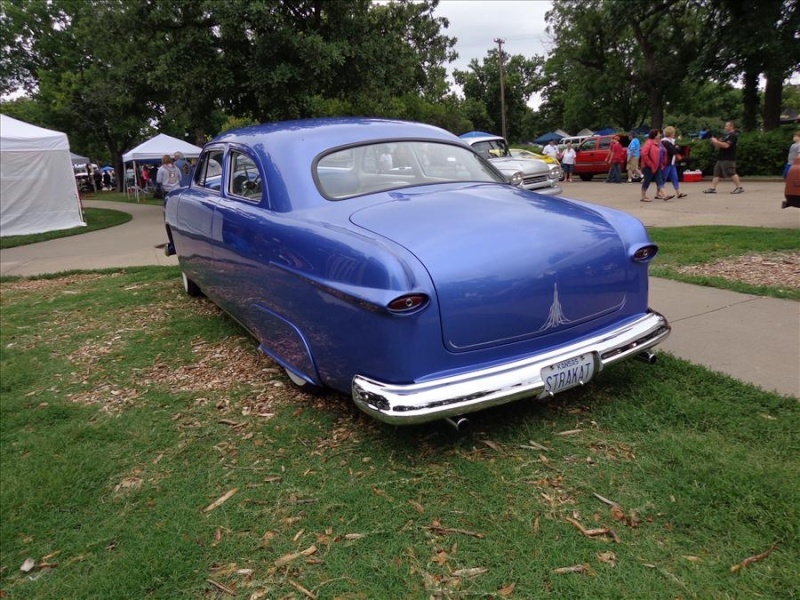 Mercury fender skirts. 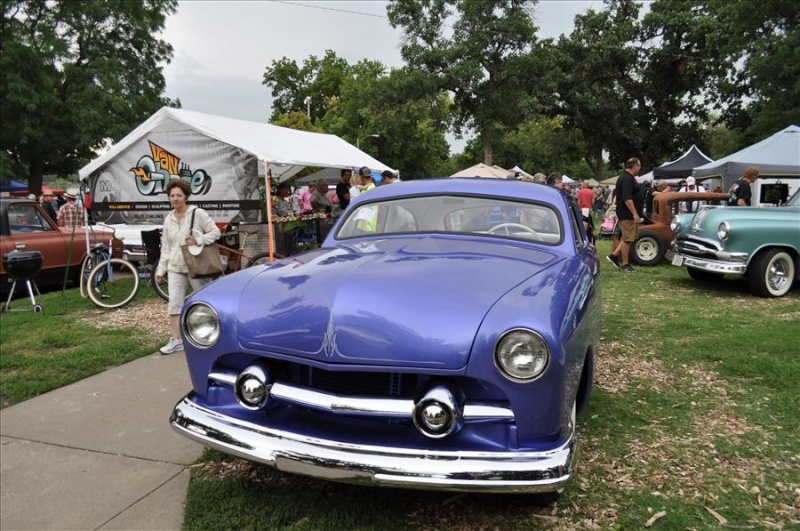 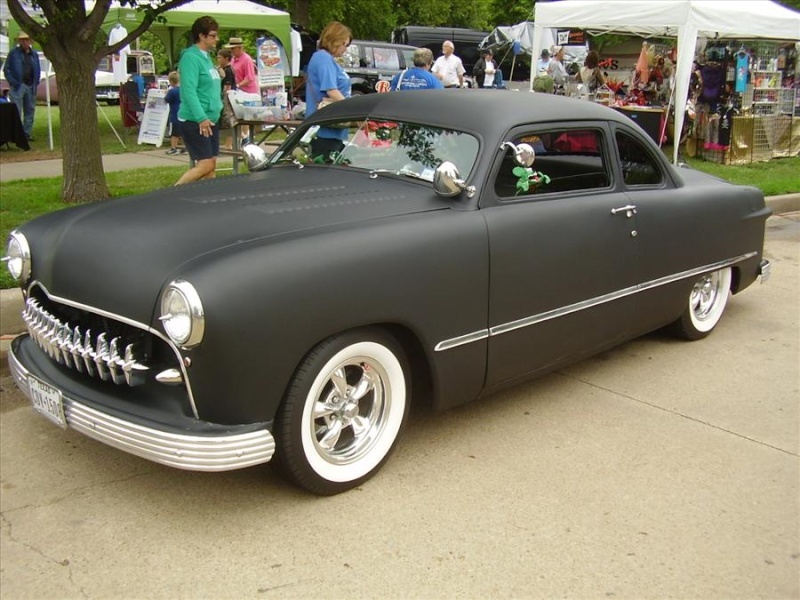 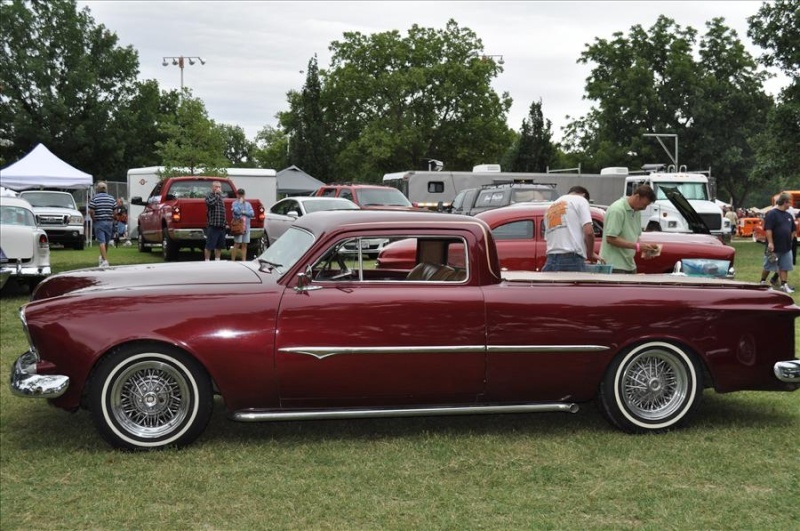 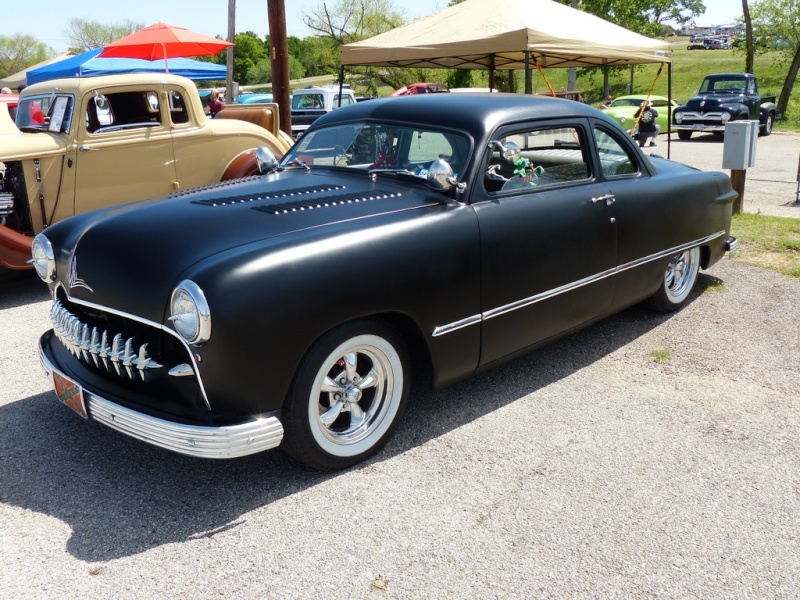 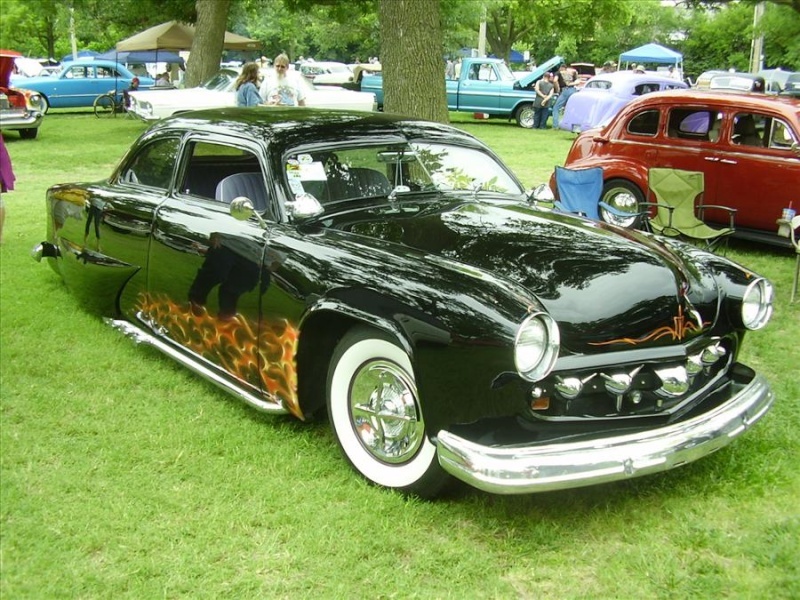 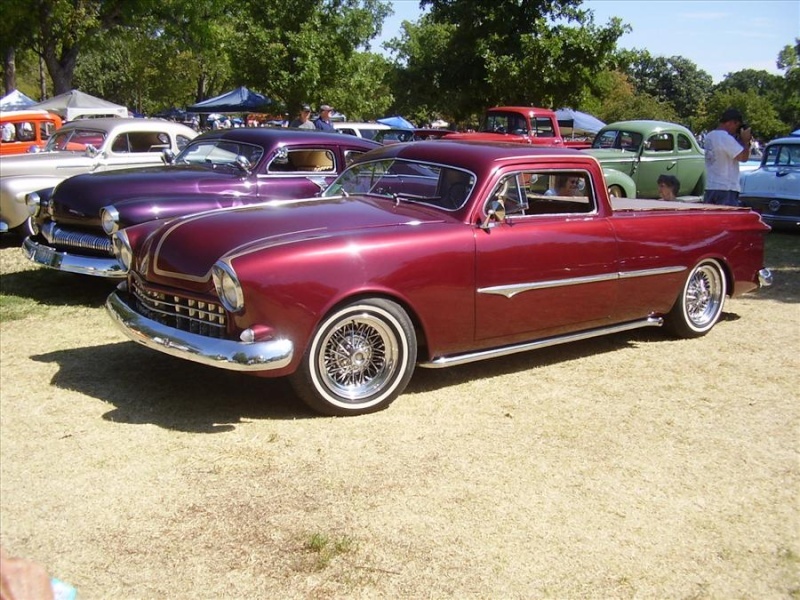 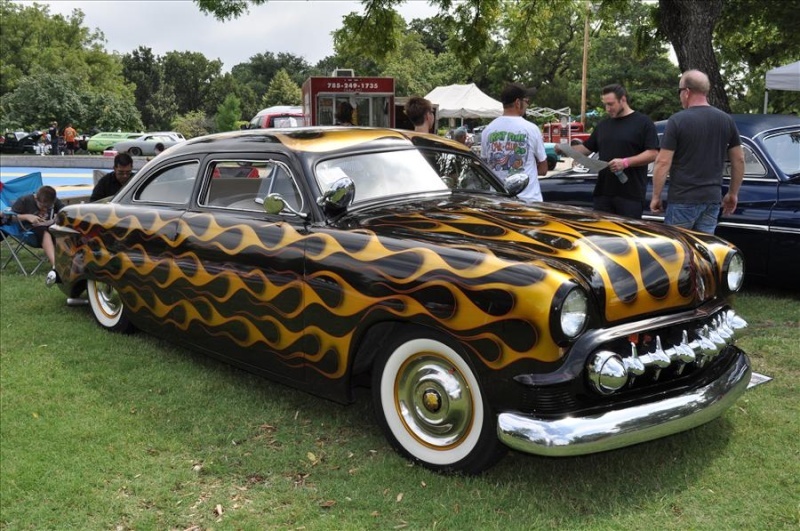 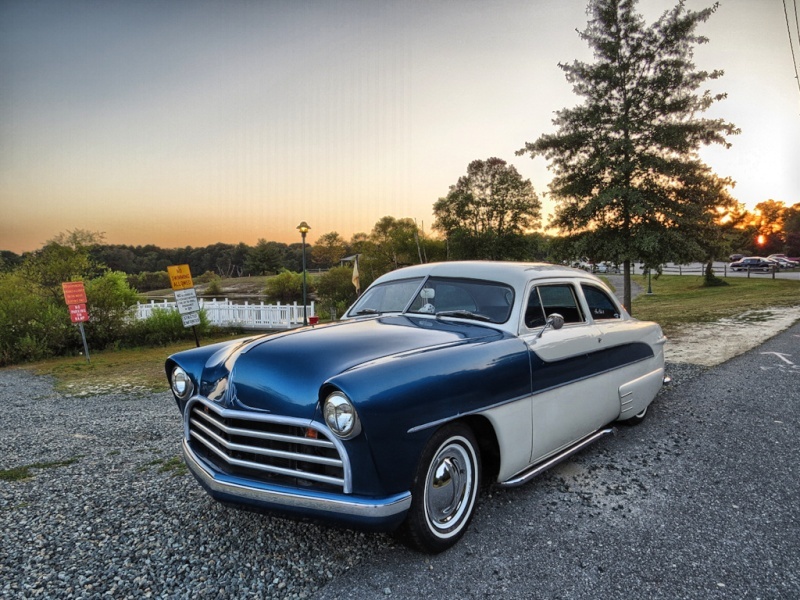 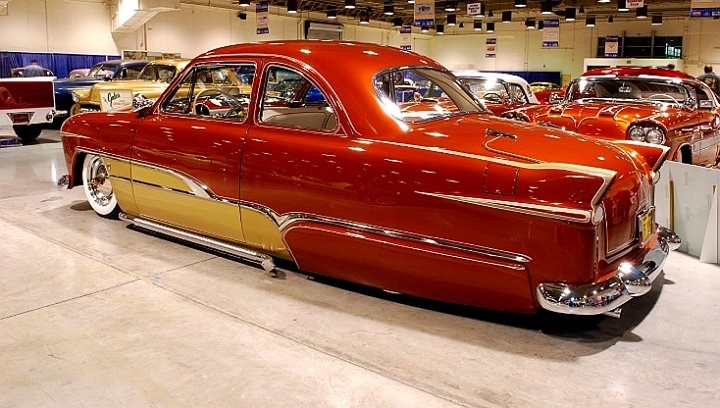 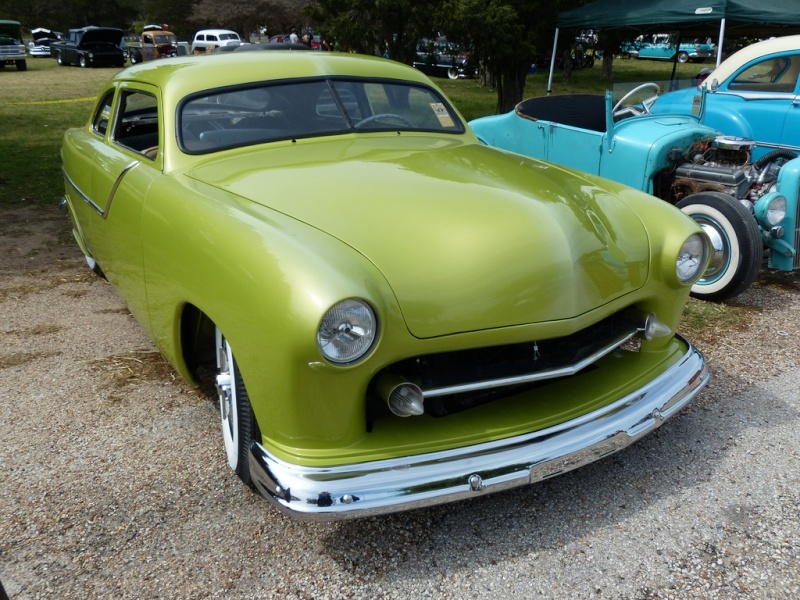 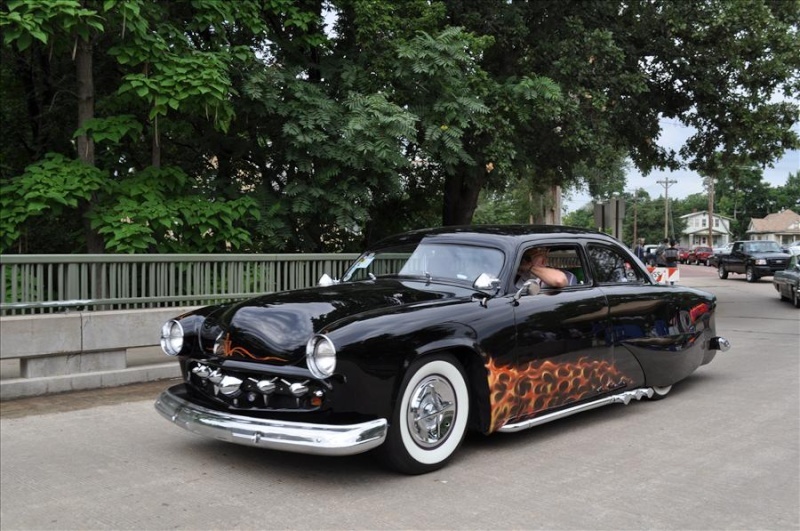 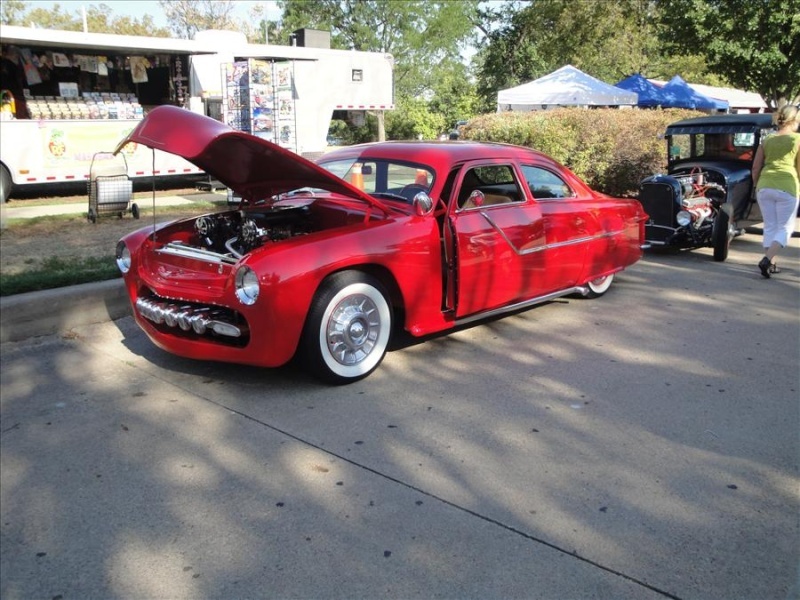 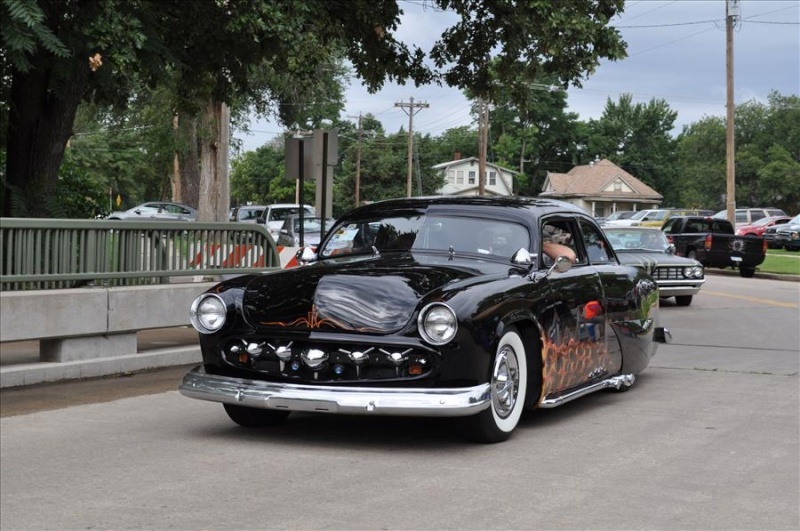 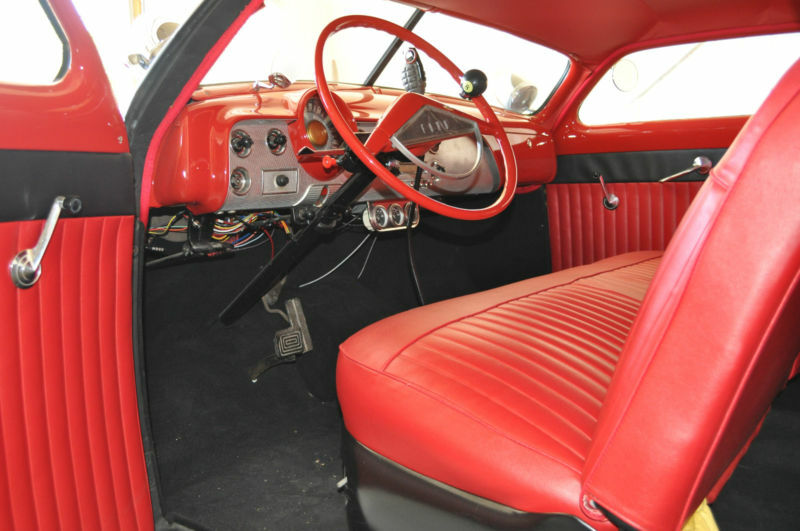 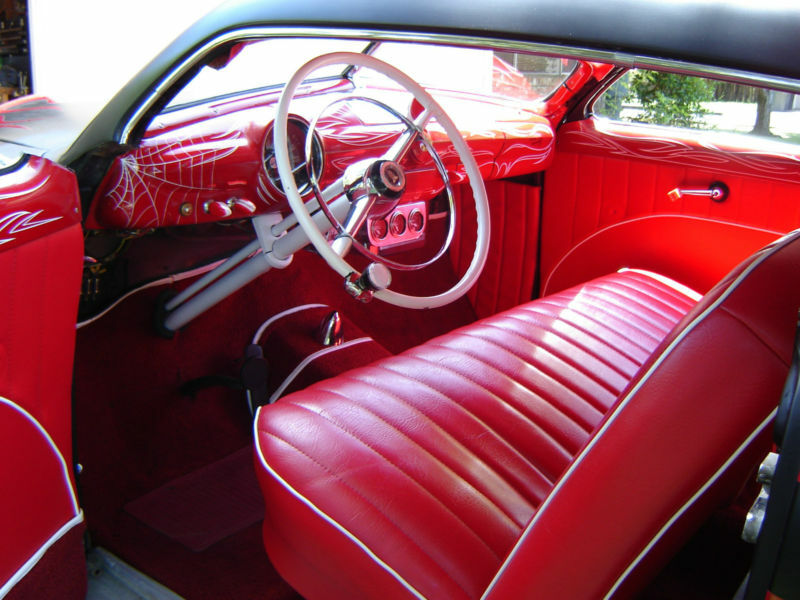 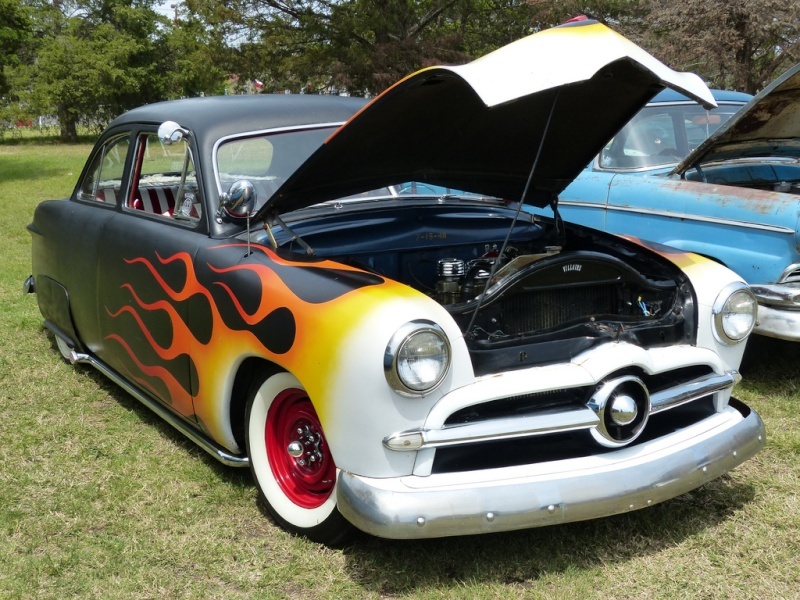 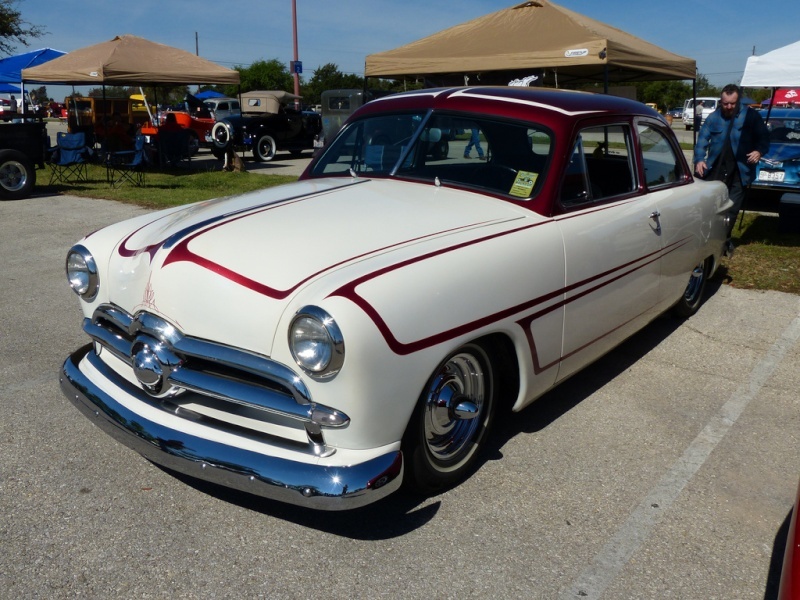 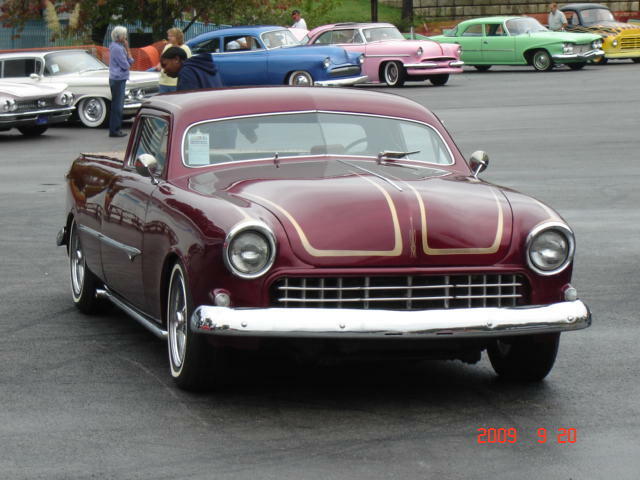 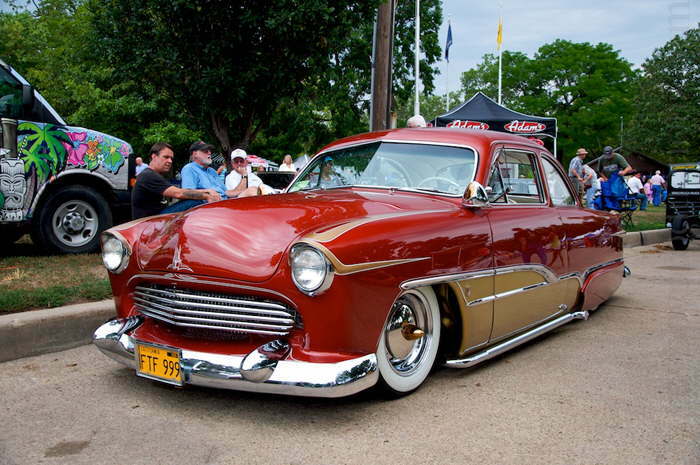 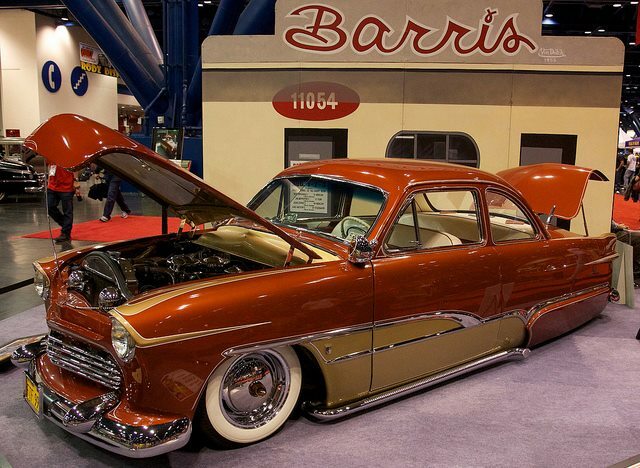 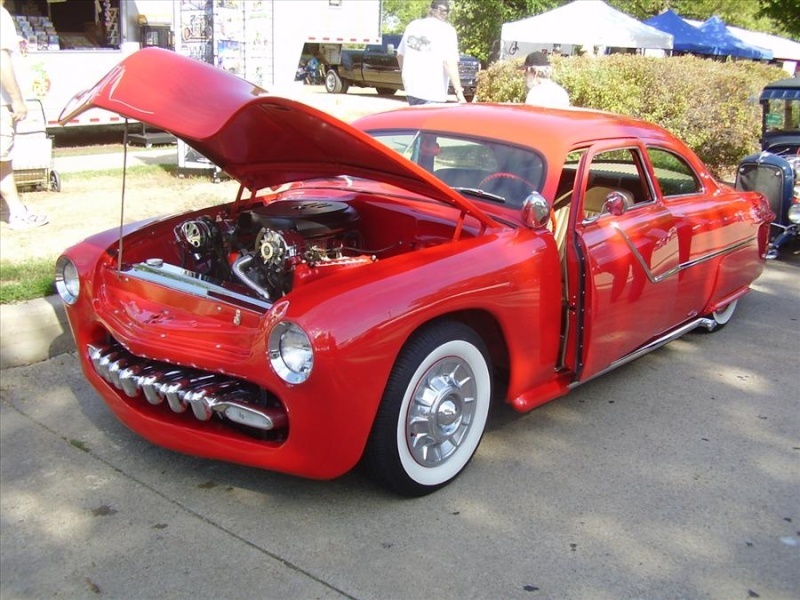 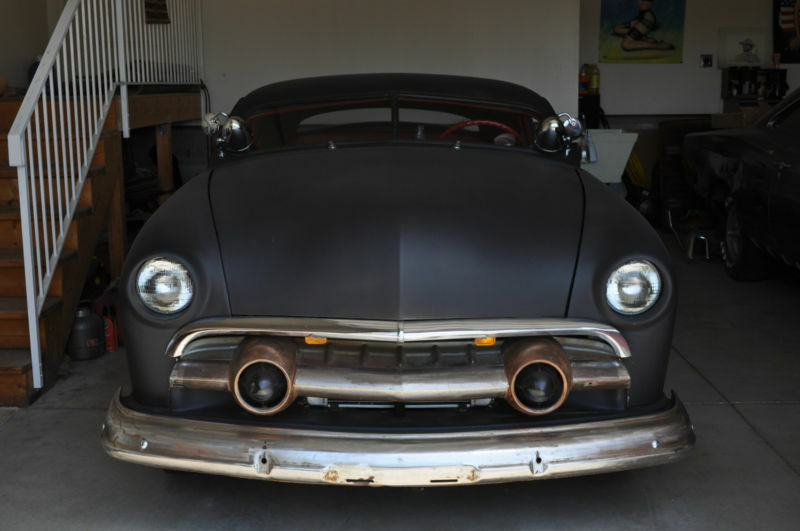 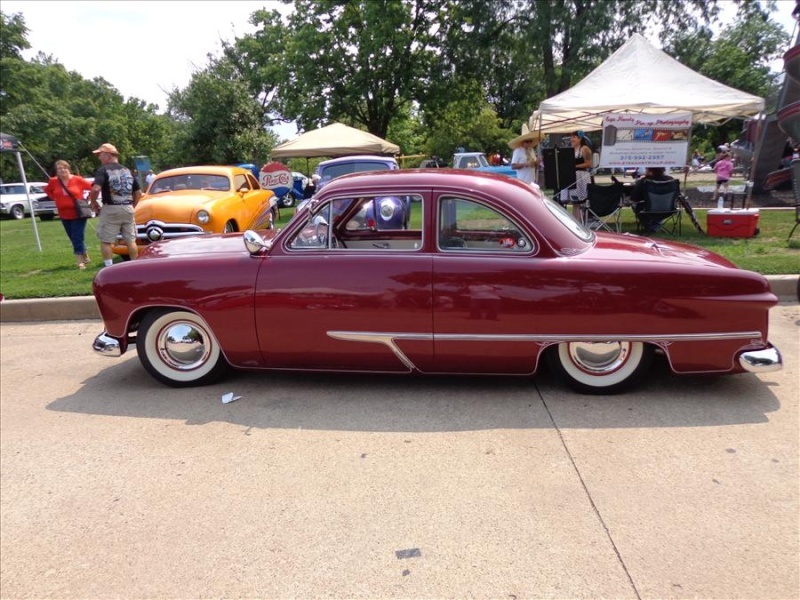 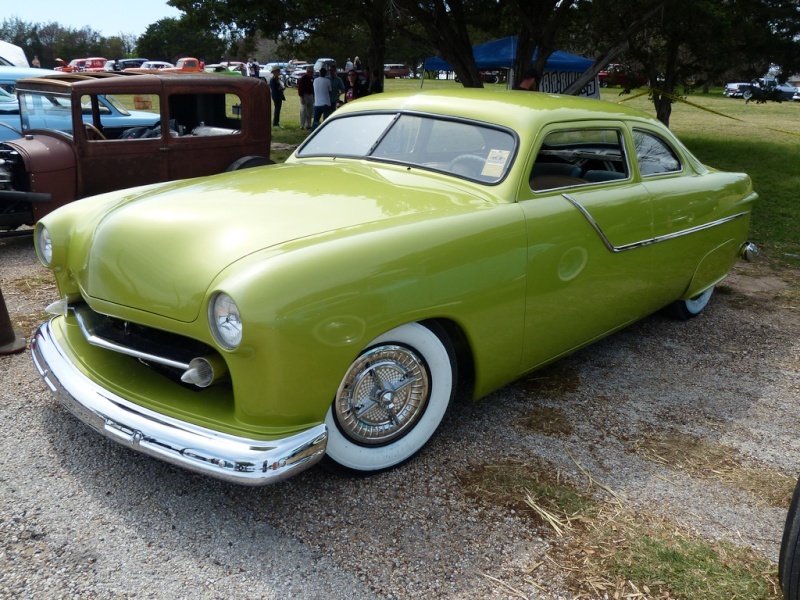 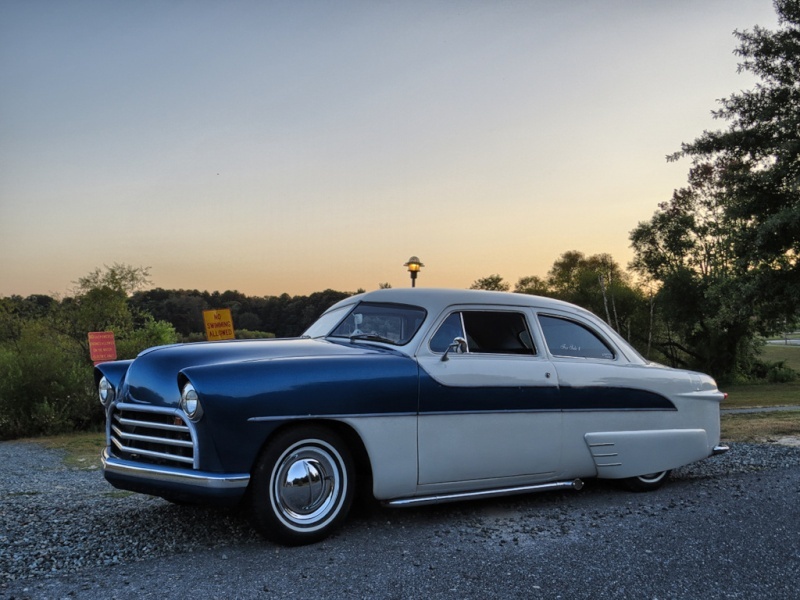 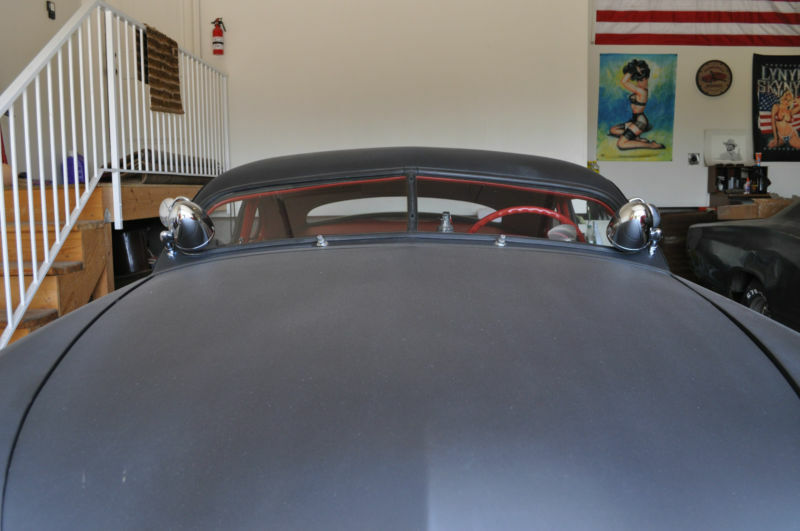 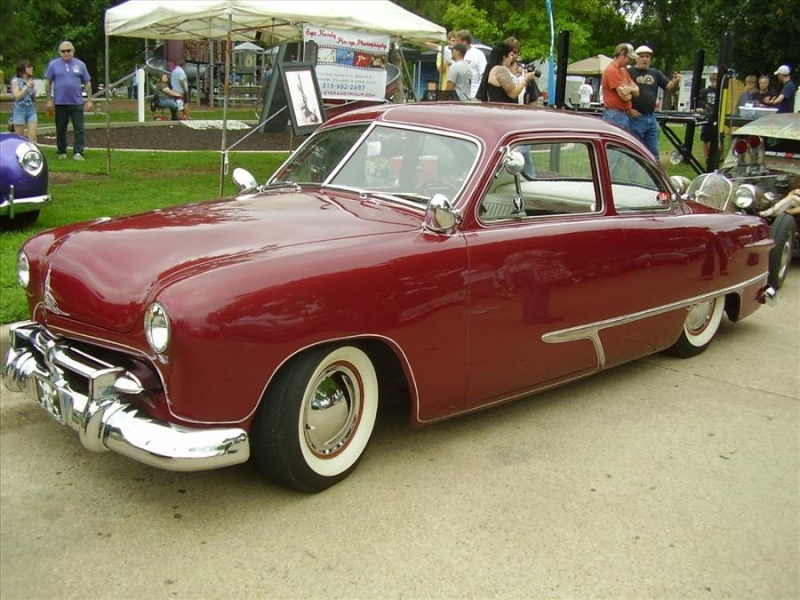 This 1950 Ford has the "old school" look with modern upgrades. 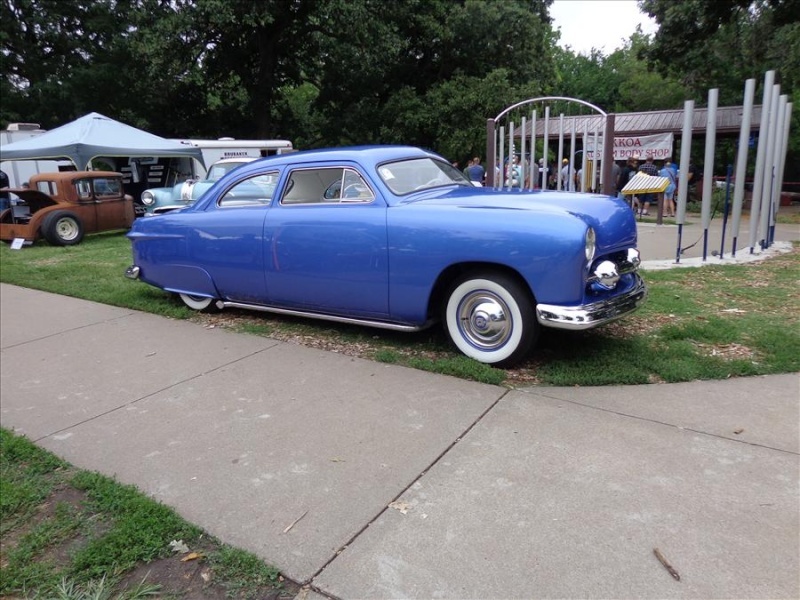 It has a 302ci fuel injected engine from a Lincoln Mark VII along with an automatic overdrive transmission and runs fantastic. 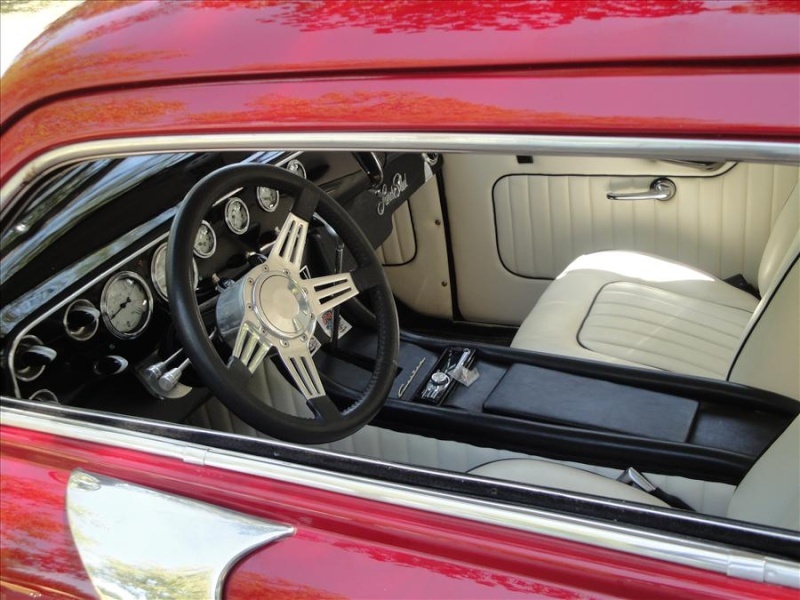 The Ford has power disc brakes and manual steering. 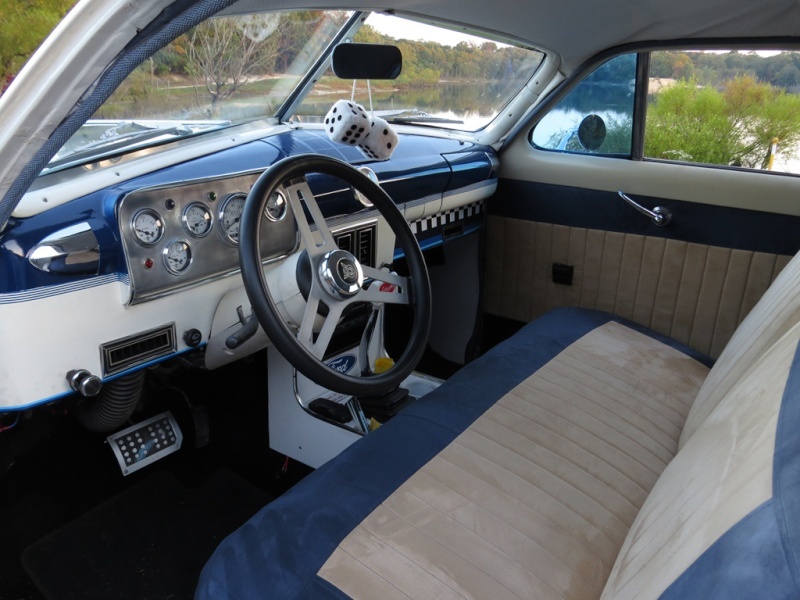 It has 2 speed electric wipers, ice cold air conditioning and a heater as well. 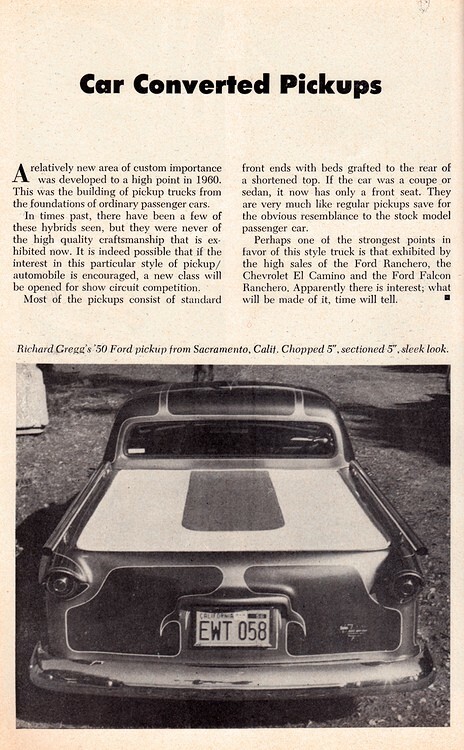 The floor pans were cut out and replaced. 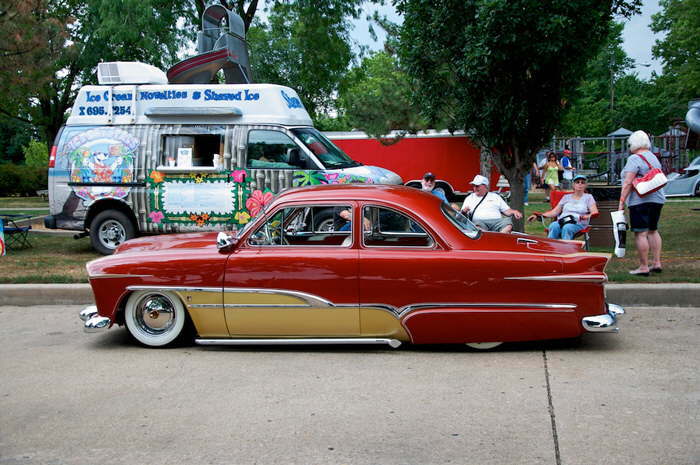 The top is chopped 3 inches and the car is dropped 3 inches it rides great with no scraping bottom. 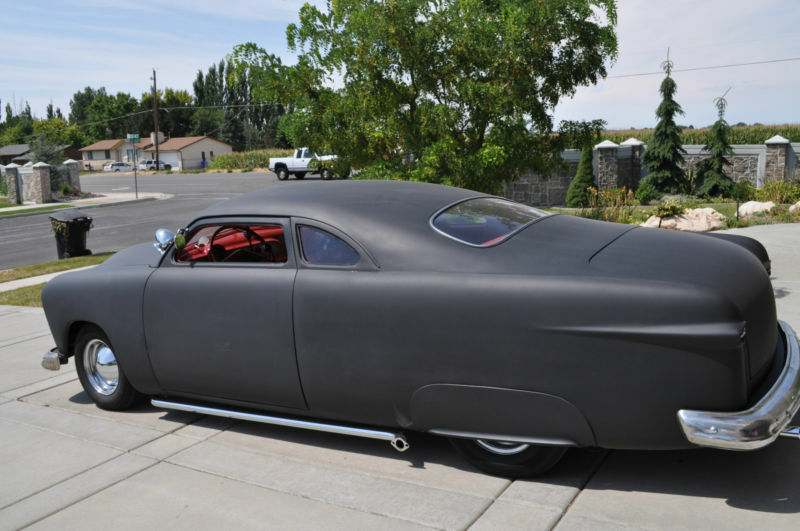 It has air shocks on the back. 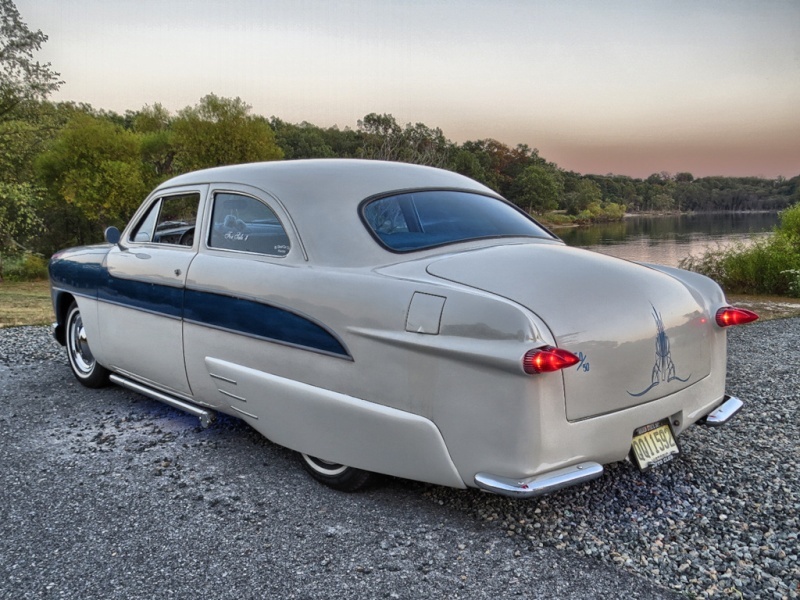 The front fender caps and headlight hoods are from a 1955 Plymouth while the tail lights are frenched 1959 Cadillac. 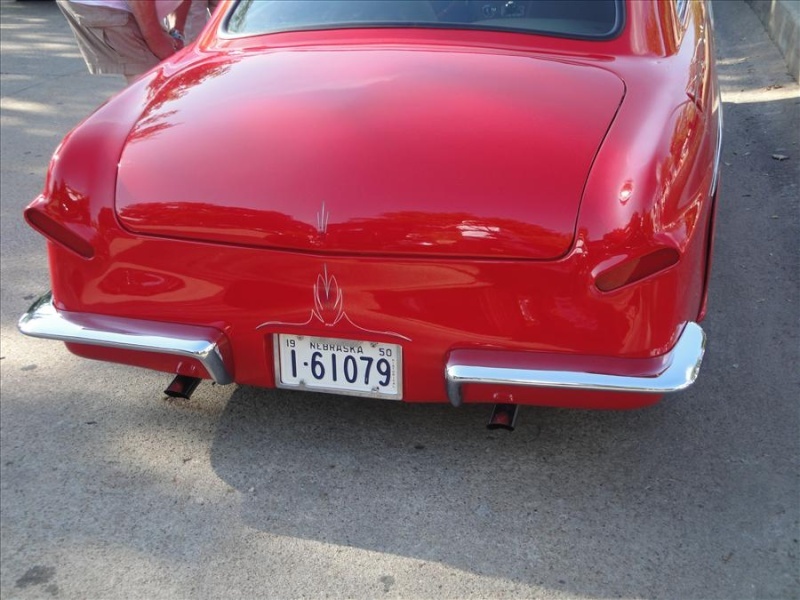 The rear bumpers are new Chevelle R/S. 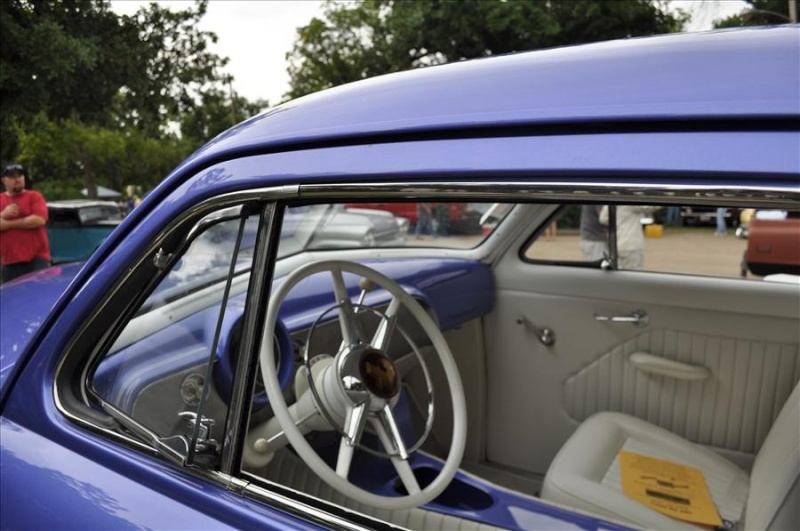 The beautiful colors are Mercedes pearl white and fleet blue base coat/clear coat. 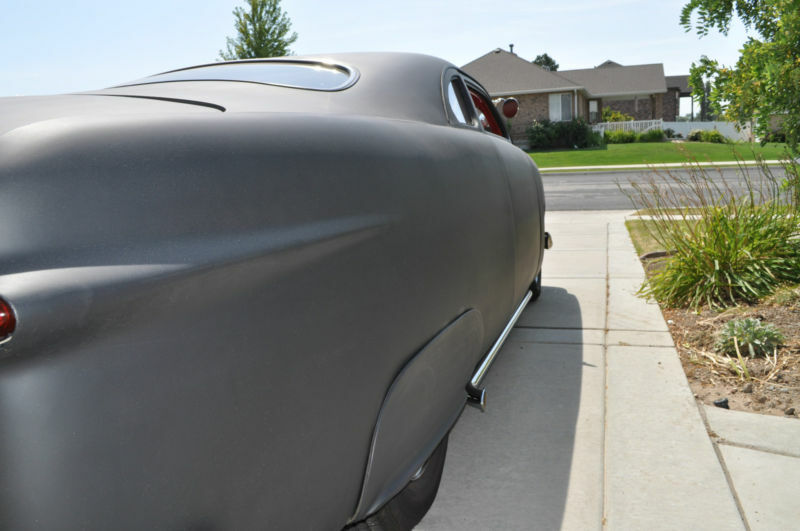 The side trim is airbrushed on and has little sparkles even on a cloudy day. 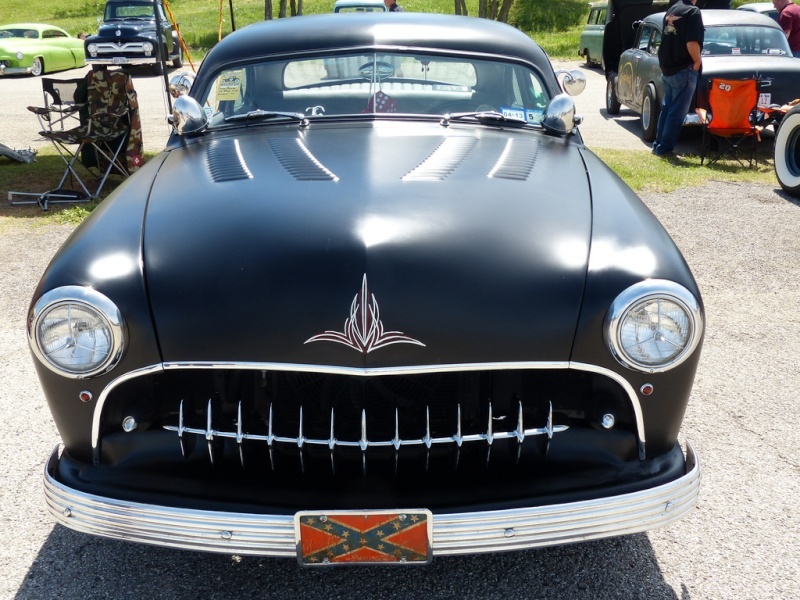 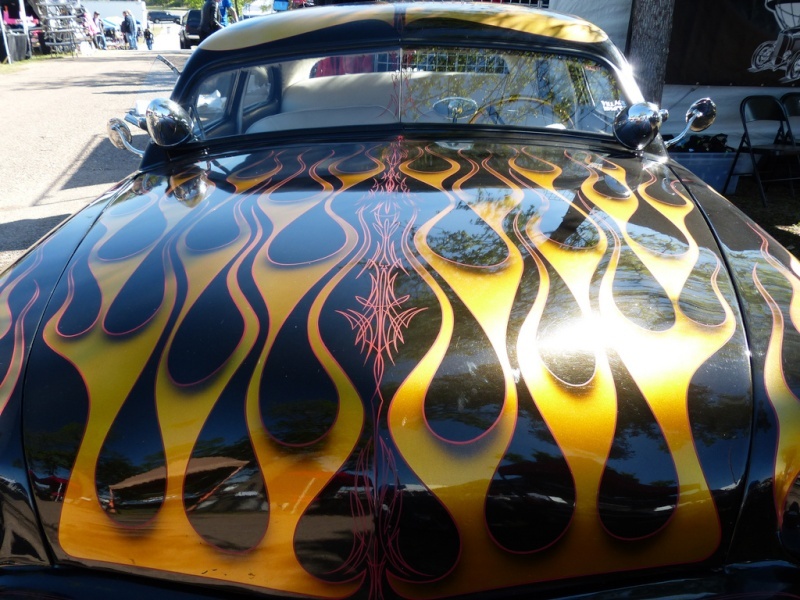 The hood is nosed and the trunk is shaved with real "Von Dutch" style pin striping not decals. 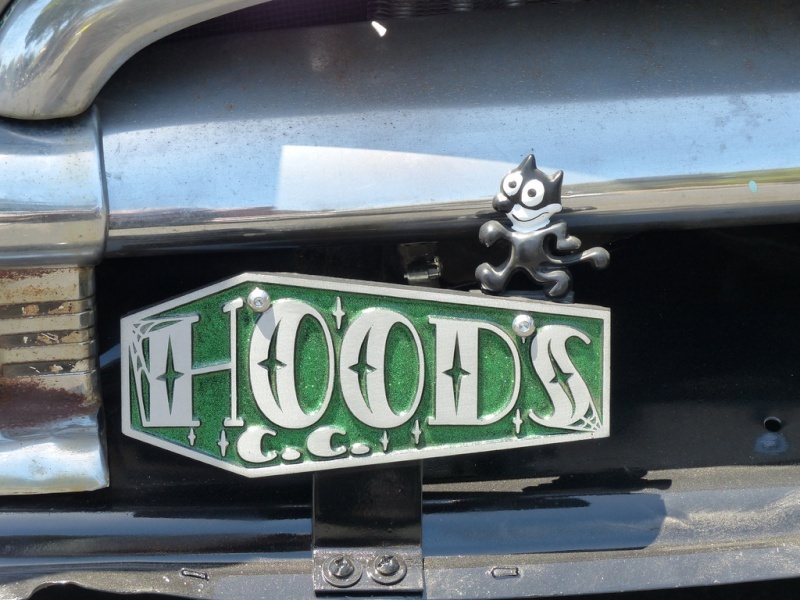 The eyes of course can't miss the cruiser skirts, lake pipes and flipper hub caps. 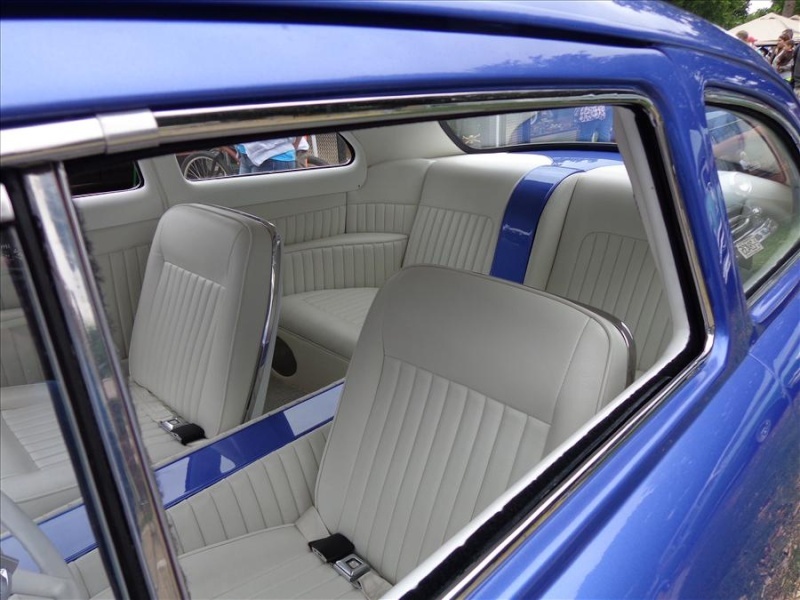 The interior is blue and tan suede with white vinyl headliner. 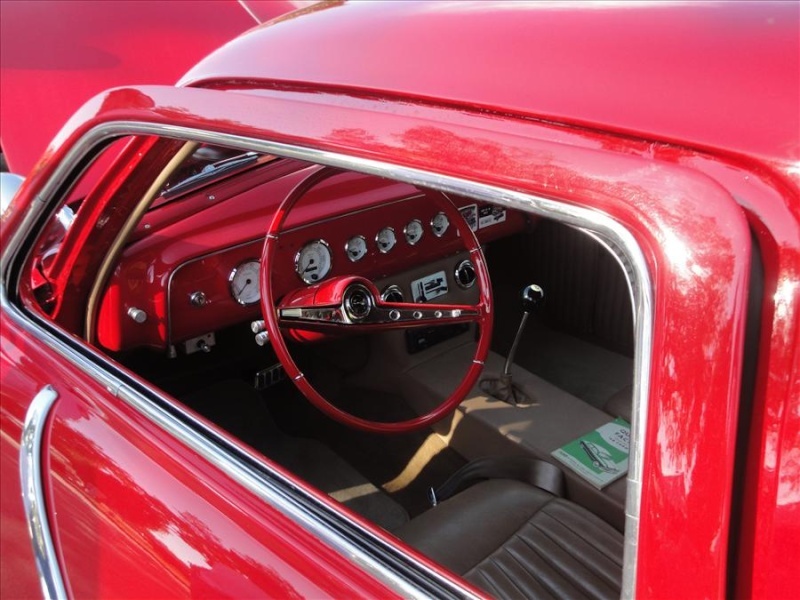 The custom dash features a Stewart Warner gauge cluster and CD player. 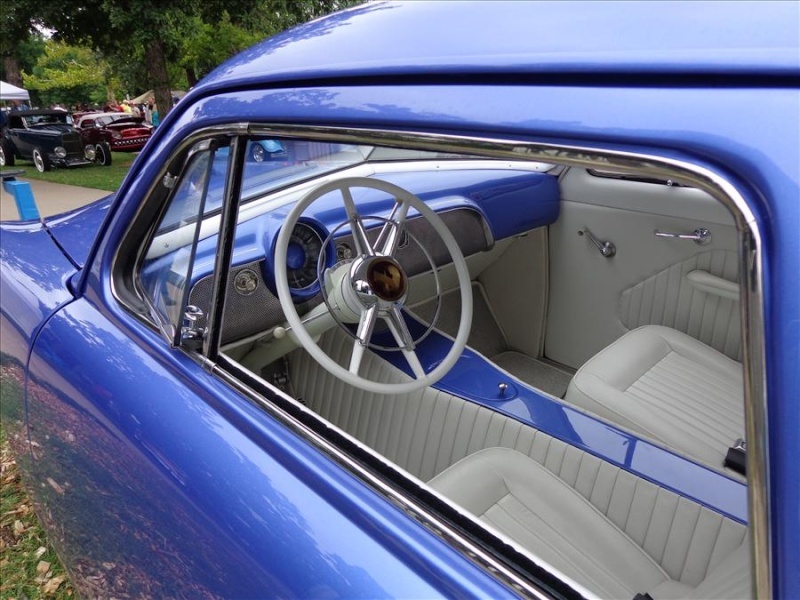 The glass is all new with power windows. 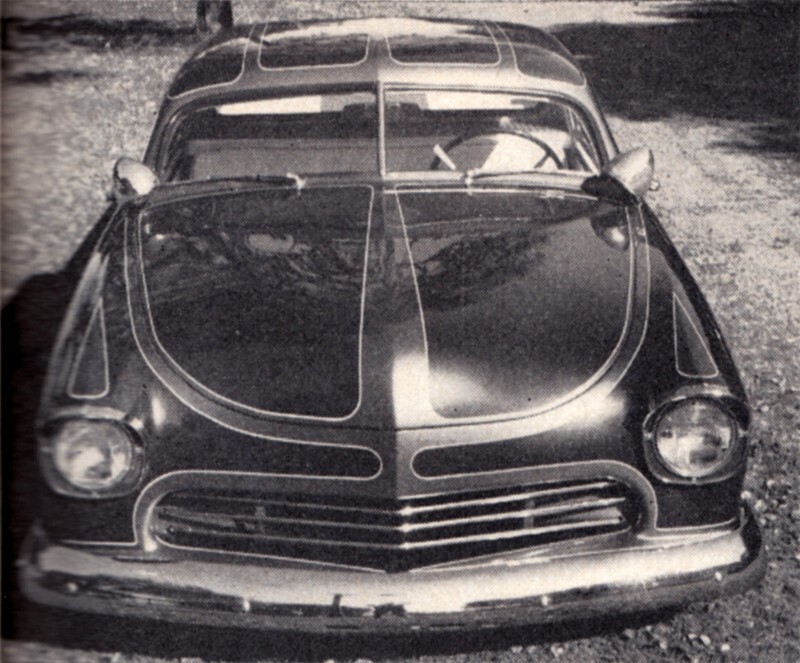 Tons of labor and money went into building this car and my loss is your gain. 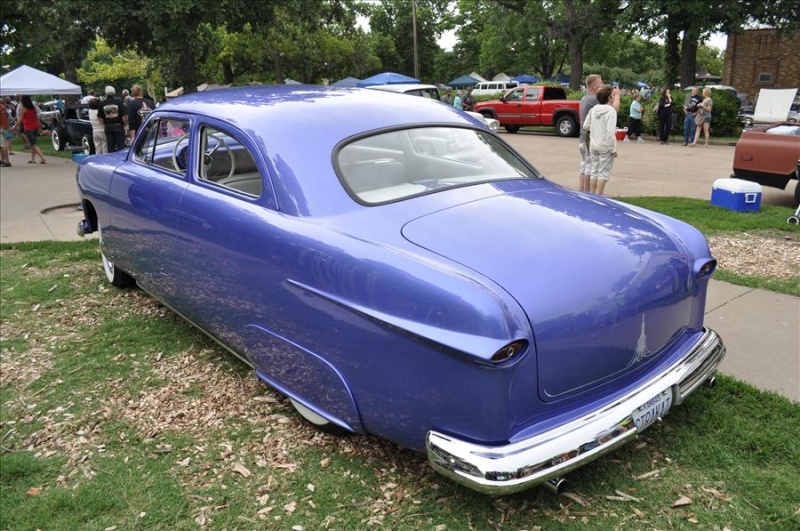 There is blue neon undercarriage lights plus lights under the hood and in the trunk for that super effect when cruising.